Combined, the roughly 20 percent drop in Facebook and Twitter stock prices on Friday wiped out about $120 billion in shareholder value. Coincidently, on the same day Facebook and Twitter shareholders took a giant hit to their net worth, the U.S. Bureau of Economic Analysis announced the U.S economy (as measured by GDP) grew 4.1 percent last quarter. “The Republicans giveth and the Democrats taketh away,” piped a radio host on an afternoon talk show here in Philadelphia. To give the Republicans total credit for the current strength of the U.S. economy may be an over-simplification of how the economy works, but there may be some merit to the claim. But to imply the Democrats are responsible for Facebook and Twitter losing between 15 and 20 percent of their stock value? That assertion strains even my credulity. Still, let us give both assertions a spin. Is the Trump administration responsible for current economic growth? To the extent any president can alter the direction of the economy in the short-term, Trump has probably done as much as any past president during peacetime. The Trump tax cut (which largely went to corporations and the wealthiest Americans). A surge in defense spending. A rollback in some environmental regulations, and on-going attempts to repeal others. All potentially impactful on the economy. But when the recent quarter’s GDP surge of 4.1 percent is viewed relative to the past 70 years (Figure 1), it is hardly outstanding. It’s good, but not unprecedented. Nonetheless, recent economic growth has been stronger than the Obama administration’s average growth rate, and it is reasonable to suggest Trump has had a marginal impact on the economy. In my back-of-the-envelope analysis (shown in the Figure 2), the Trump administration can arguably take credit for over $300 billion in above average U.S. economic growth this past quarter. If you compare Trump’s average quarterly GDP growth to Obama’s in Figure 2, it is apparent that economic growth has picked up since Trump took office (2.9% versus 2.1%, respectively). Since Obama inherited an economy in far worse shape than did Trump, the better comparison might be Obama’s average quarterly GDP growth in his last four years in office (2.3%) to Trump’s between 2017 Q2 to 2018 Q1 (2.6%). If you believe Obama deserves credit for the strong economy during Trump’s first year in office, economic growth in 2018 Q2 still outpaces average economic growth during the other quarters in Trump’s term (4.1% versus 2.6%, respectively). As to why we’ve seen higher growth recently, the general consensus among economists points to greater business optimism, particularly among smaller businesses, along with the relaxation of the federal regulatory environment, and a surge in stock and housing prices. Surprisingly, among even conservative economists and financiers the Trump tax cut gets little credit for current economic growth. In fact, the fear among some economists is that the tax cuts add so much to the budget deficit that the Fed could be forced to move interest rates higher which would, in the long-term, overwhelm whatever positive impact the Trump tax cuts in the short-term. The additional national debt Trump is accumulating through his combined policies of tax cuts (primarily targeting the wealthy) and increased defense budgets could result in a significant budget crisis in the next four years. However, as of today, the Trump economy is strong and not likely to recede into a recession in the next twelve months. Though, by historical standards (see Figure 1), U.S. economic growth under Trump is not as robust as it was under Eisenhower, JFK/LBJ, Reagan or Clinton. Nonetheless, it would be dishonest to suggest the U.S. economy is anything but strong and positioned to stay that way for at least another year. And Trump deserves some credit. Now, are the Democrats guilty of talking down the stock values of Facebook and Twitter? That’s a bold statement and most likely impossible to prove. The Facebook and Twitter stock price drops were inevitable, but did the Democrats make it worse? Yet, why did the stock prices for Facebook and Twitter drop as much as they did in the midst of such economic prosperity? Analysts blame disappointing user and earnings growth brought on, in the case of Facebook, by the shrinking number of people available for future growth. According to media writer Max Read, Facebook’s 241 million monthly active users represent “about 87 percent of Americans and Canadians who have the ability to use Facebook” and do. Despite announcing their third consecutive profitable quarter, Twitter also reported 335 million monthly active users during the latest quarter, down from 336 million during the first quarter of 2018. Down just 1 million monthly active users, yet their stock price sheds more than 14 percent — evidence that investors care more about user numbers than advertising revenues when analyzing social media companies. Investors have legitimate concerns about how Facebook and Twitter measure their monthly user numbers. Some analysts have argued that social media companies have been exaggerating their user numbers from the beginning and have kicked this problem down the road for far too long. Tech writer Kerry Flynn recently summed up the evidence beautifully in an article located here. And last October Twitter pretty much admitted they have been fudging their audience numbers. To their credit, Facebook and Twitter have been cleaning up their user base measurement act, particularly following the negative coverage of their role in Russia’s meddling in the 2016 election. Which is why the stock price declines on Friday seemed like an over-reaction to what was a small decline in Twitter’s user base and a smaller-than-expected increase in Facebook’s user base. No, the stock price drops on Friday reflected something else and I don’t think its a mystery what that ‘something else’ might be. The social media stock price drops on Friday were the malignant side effect of the on-going Russiaphobia epidemic being promoted by the Democratic Party and their confederates in the news media. Whatever harm the Russians did to the American electoral system in 2016 (and they clearly did something), it is nothing compared to the damage being done to Facebook and Twitter as they try to modify their services to address narrow partisan concerns over such things as ‘fake news’ and community content standards. Twitter and Facebook both said their recent efforts to address Russia’s interference in the 2016 election contributed to their disappointing user numbers. Twitter, for example, said in a press release last week that its deletion of “malicious automation, spam and fake accounts,” in addition to addressing Europe’s General Data Protection Regulation was the cause of the 1 million user drop off last quarter. Facebook, likewise, has ratcheted up their efforts to shed fake accounts and suspend users that violate their service’s community standards and rules. All could things to do, and something the social media companies should have addressed from their inception. Some of what Facebook and Twitter is doing to improve their services is a good thing (verifying identities, making it harder to create multiple accounts, limiting automated bots, improving user base metrics). Unfortunately, the hysteria around the Trump-Russia investigation is introducing some really bad ideas into social media communities. The best example is Twitter’s healthy conversation program and subsequent shadow banning algorithms could potentially destroy Twitter’s inherent purpose by turning into a ‘safe space’ for the Resistance and other like-minded folks. The early result of Twitter’s healthy conversation program appears to be biased towards crowding out conservative voices on Twitter (good explanations of this possible problem can be found here and here). And, according to Gab.ai CEO Andrew Torba, Democratic activists may already be gaming Twitter’s new healthy conversation algorithm by propagating ‘block lists’ to fellow activists which leads to a disproportionate percentage of account suspensions being issued for conservative voices on Twitter. If this claim about Twitter’s growing political bias is accurate, and I still have some doubt, it will result in the end of what made Twitter great in the first place. And Facebook may be following Twitter down this same rat hole. Russiaphobia has induced a partisan element into the dialogue between social media companies, the news media, and the political class that may well drag Facebook and Twitter down a path from which their stock prices may never recover. And, yes, we can blame the Democrats for this outcome, if it happens. Facebook and Twitter stock prices shed around $120 billion on Friday, largely due to slower-than-expected user growth. Both social media companies are blaming programs they’ve implemented to address automated bots and fake accounts, problems exposed during the current Trump-Russia collusion investigation. According to a Pew Research Center study, two-thirds of tweeted links to the web’s most popular sites are generated by automated bots (i.e, not human beings). These Twitter bots are largely built by private corporations and political organizations. “The (Pew) bot study is a reminder that a large portion of what happens on Twitter is simply machines talking to machines,” says business and technology writer Chris O’Brien. In addressing congressional concerns about how many people may have been exposed to Russian social media propaganda in 2016, the Trump-Russia investigation has laid bare the inaccurate audience metrics used by Facebook and Twitter. That is a good thing. In October 2017, Twitter announced it had included users of third-party applications as part of their user base. According to a Twitter management letter to its shareholders, since the fourth quarter of 2014, this method over-counted Twitter users by “an average of 1 million to 2 million users per quarter.” Facebook has faced similar criticism. Internet audience measurement services such as Quantcast, Verto Analytics, and Nielsen have reported the methodological flaws in social media audience numbers for years but were too fragmented and unstandardized to shift investor sentiments. Hopefully, that has now changed. Facebook and Twitter shareholders may not agree now, but in the long-run this stock price drop was a necessary correction as it will force all social media networks to tighten up their audience metrics so they better reflect the actual number of human beings using their social network services. The mainstream media’s bullying surrounding Russiaphobia has opened the door for Facebook and Twitter to discriminate against people based on their attitudes, preferences and opinions. In trying to placate frenzied media critics, Facebook and Twitter have since last year started to block or delete, not just Russia-sourced accounts, but also “far-right” accounts that arguably promulgate “fake news” and “hate speech.” The problem is, the humans at Facebook and Twitter have built deeply-flawed algorithms that force machines to decide what user accounts to suspend or delete. At one point Facebook’s ‘hate speech’-identifying algorithm determined that the posting of the Declaration of Independent by a Texas newspaper, the Liberty County Vindicator, qualified as ‘hate speech’ and therefore was tagged for deletion. Only after notifying the Vindicator of its offense did Facebook realize it had made a mistake. And what was is the ‘hate speech’ found in the Declaration of Independence? While Facebook can be commended for admitting the absurdity of their targeting algorithms, their admission has only amplified the exposure of other cases where legitimate Facebook or Twitter users are being blocked or suspended. Twitter was reportedly suspending one million Twitter users a dayduring one of its more recent purges. And who exactly is being suspended? It is hard to tell since the social media companies don’t share their proprietary algorithms with the public. However, there is anecdotal information emerging that suggests social and political conservatives are disproportionately being affected. Am I sure of this? No. But it increasingly sounding plausible. One interesting shadow banning case has been brought to my attention by Andrew Torba, the co-founder of Gab, an advertising-free social network dedicated to preserving freedom of speech and the free flow of information on the internet. Dr. Wright is shadow-banned on Twitter. Why?, you ask. After a few phone calls, a Google search and a background check on Mr. Wright, I found no obvious reason for why Mr. Wright is shadow banned. The National Review’s Jack Crowe has identified other Republicans and conservatives that have been shadow banned, including Donald Trump Jr.’s spokesman Andrew Surabian (@Surabees). Twitter has been quick to end the ‘shadow ban’ on prominent Republicans that have not passed the ‘healthy conversation’ filter. Still, the fact that this could even occur in the first place is chilling. Torba is not holding back on what he thinks is going on. “Twitter is actively interfering in the U.S. midterm elections,” he says. And how is Twitter doing this? By widely distributing and sharing the block lists with other Democratic activists, says Torba, these activists effectively flood Twitter’s shadow banning algorithm with hundred of thousands of Republican and conservative Twitter users who are then shadow banned. To be fair, Twitter is already addressing this problem. Nonetheless, it demonstrates the opportunity for the social media services (not just Twitter) to discriminate against people they decide engage in ‘unhealthy’ conversations. Given the political donation patterns of Silicon Valley executives, I would not be surprised if their definition of ‘unhealthy’ speech discriminates against Republicans and conservatives. Are conservatives just being snowflakes? Perhaps. But with Republican Florida Rep. Matt Gaetz’ threat to file a Federal Election Commission complaint against Twitter over the shadow banning, it is unlikely Twitter will dismiss this issue as mere Trumpian paranoia. 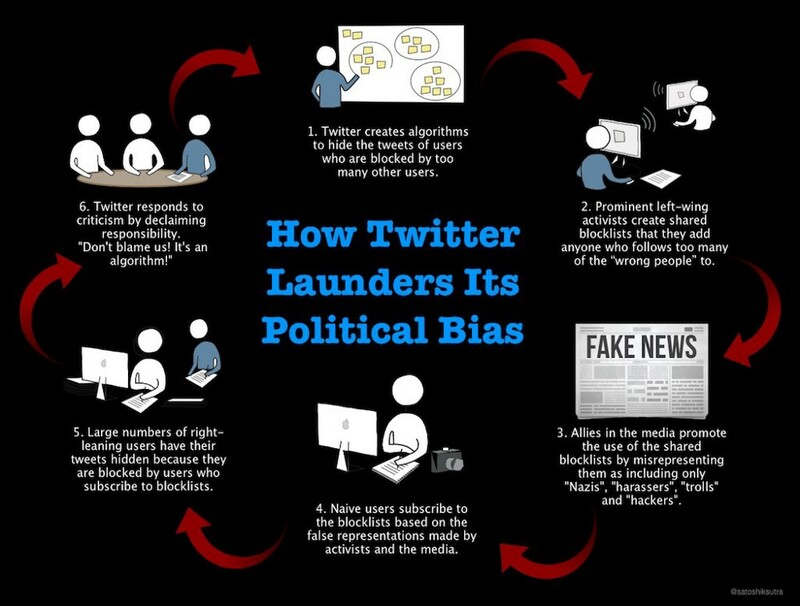 Regardless of how well Twitter addresses the possible discriminatory effects of its shadow banning algorithm, Twitter and Facebook users across all political inclinations need to be vigilant in holding social media companies accountable for any discriminatory business practices. This is not a freedom of speech issue, per se, but if Facebook and Twitter want to continue as valued online communities, allowing political bias to influence who can and can’t participate in these communities is unacceptable. Is it unhinged hyperbole to suggest Facebook and Twitter, in the current political environment, might morph into safe-havens for liberals and Democrats only? I don’t think so. In fact, Facebook and Twitter are already going down that path. And if they continue, don’t be surprised if their stock prices take more big hits down the road. Charisma: Some politicians have it, but how do we know? Last year, I was excited to read that a team of University of Toronto psychologists had come up with a quantifiable and validated measure of ‘charisma’ — an elusive construct that has never been well-defined or measured in a consistent way by academics and writers. Charisma is one of those, “I know it when I see it” type of phenomenon. Yet, collectively, people can generally create a common list of those who possess this trait in greater quantities than the average person. Politics, in particular, has a rich history of charismatic leaders: Franklin Delano Roosevelt, Theodore Roosevelt, John F. Kennedy, Bill Clinton, Martin Luther King, Malcolm X, Ronald Reagan, Jesse Jackson, etc. So, last fall, when Konstantin O. Tskhay, R. Zhu, C. Zou, and Nicholas Rule published their research on charisma, Charisma in Everyday Life: Conceptualization and Validation of the General Charisma Inventory, I was hopeful. These researchers created the General Charisma Inventory (GCI), a six-item, self-reported inventory of questions used to measure someone’s level of charisma. Using a combination of exploratory and confirmatory factor analytic techniques to construct this six-item measure of charisma, they empirically tested their operationalization of the charisma construct and found it to be observable, consistent with public conceptions, and predictive of real-world outcomes (i.e., persuasion). The first three questions measure a person’s “persuasiveness” and the last three measure their “affability” (i.e., likability). Unfortunately, my enthusiasm for the GCI waned quickly as it became apparent the researchers had come dangerously close to confounding the measurement of the GCI (an independent variable) with the outcome they were trying to explain (persuasion). This is a problem far too common and hard to avoid in psychometric research. In Toronto researchers’ derivation of the GCI, two factors largely defined its measurement: a person’s (1) persuasiveness and (2) likability. In other words, if someone is persuasive and likable (i.e., charismatic) they are able to persuade others. That is the definition of a circular argument and it offers very little empirical value since the GCI correlates strongly with persuasion outcomes by definition, not by construct validity. Fond, Ducasse, Attal, Larue, Macgregor, Brittner, and Capdevielle, Charisma and leadership: new challenges for psychiatry, Encephale. 2013 Dec;39(6):445–51. 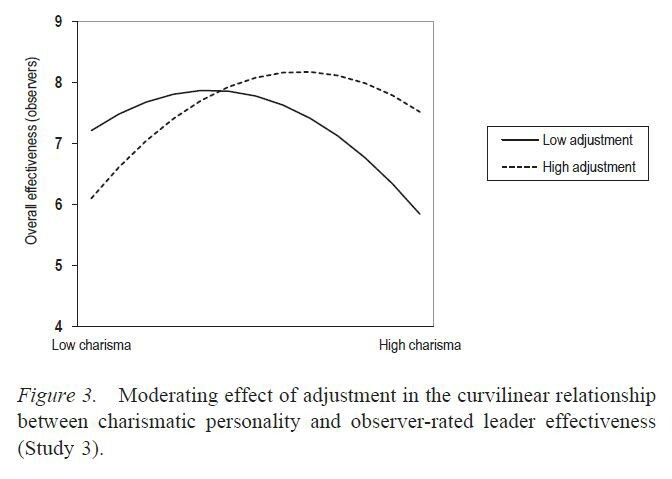 Vergauwe, Wille, Hofmans, Kaiser, de Fruyt, The Double-Edged Sword of Leader Charisma: Understanding the Curvilinear Relationship Between Charismatic Personality and Leader Effectiveness, Journal of Personality and Social Psychology, 2018, Vol. 114, No. 1, 110–130. The Vergauwe, et al. research is especially interesting in that it attempts to answer the question: Can someone be too charismatic and therefore less effective at persuasion? According to these researchers, the answer is an emphatic ‘yes’. Some leaders, when facing high pressure situations, are better than others at adjusting to the situation and remaining “self-composed” ( see research by Hogan, R., & Hogan, J. (2007). Hogan Personality Inventory manual. Tulsa, OK: Hogan Press). Building on Hogan and Hogan (2007), Vergauwe, et al., found that charismatic leaders who are good at such adjustments are also more effective at persuasion. Figure 3 (below), reprinted from their research article, shows the two distinct effectiveness curves for leaders with ‘low’ and ‘high’ levels of adjustment (self-regulation). The Merriam-Webster definition of charisma goes like this: a personal magic of leadership arousing special popular loyalty or enthusiasm for a public figure (such as a political leader). ‘A personal magic’? A brave attempt, I suppose, but inadequate for theory-building and empirical validation. If the prior research on charisma tells us anything is that it is a multi-faceted concept where, in practice, some charismatic individuals may be high some of these factors but low on others. Randall Collins, Professor of Sociology at the University of Pennsylvania, argues there are four kinds of charisma — on-stage charisma, backstage charisma, success-magic, and reputational charisma — and the “more kinds you have, the more charismatic you are.” He treats charisma as a quantity of something good, like money or number of close friends. Furthermore, Weber saw charismatic leadership as unstable and unsustainable over long periods of time.To him, the loyalty charisma inspires among people is less durable compared to other types of political loyalty such as tradition-based and legal-rational-based. For charisma to have any empirical value, ‘knowing-it-when-you-see-it’ is not enough, we need to know what qualities and attributes describing individuals make them charismatic, and does this charisma vary, not only across individuals, but over-time and over different contexts within the same individual. One must also make a distinction between charismatic leaders and demagogues. It is a fuzzy line as demagogues are going to have many of the same characteristics as charismatic leaders, but have one important distinction — demagogues exploit existing prejudices of the time to form a political movement. Charismatic leaders, on the other hand, may also exploit existing sentiments within a population, but also create new supporters through persuasion techniques. I may have created the same circular definition I criticized the previous research for doing — using persuasion to both define and validate the charisma construct — but I offer this difference: I define someone as charismatic if, among other attributes such as attractiveness and affability, they also engage in the systematic use of proven persuasion techniques. This definition emphasizes that a charismatic leader can employ proven persuasion techniques without necessarily being successful at persuasion [Think Barack Obama]. The relationship between charisma and persuasion is now a probabilistic one and can be empirically tested. Even if we develop a suitable definition for charisma, is there any evidence it will be useful in predicting important leadership outcomes, such as elections?The evidence in fact remains sparse in support of its impact on election outcomes. For every charismatic politician like JFK, there is a Richard Nixon, Michael Dukakis or Charlie Crist. And, no, anti-charisma is not a form of charisma. “While recognizing that charisma may manifest itself in other, perhaps indirect, ways, there would seem to us at the very least to be a need for the notion of charisma to be conceptualized more rigorously if it is to continue to be used as an explanation of right-wing populist party success,” concluded van der Brug and Mughan. The same argument has been made to explain the rise of Donald Trump and Bernie Sanders. Regardless of the existing research, ‘charisma’ remains too some consultants the holy grail of candidate X-factors that can determine who wins an election. Or so the myth goes. So why do so many political consultants believe charisma matters? Because with every election cycle we witness a new candidate, like Democrat Alexandria Ocasio-Cortez or Barack Obama in 2004, coming out of nowhere to capture the imagination of voters and the East Coast media. And what exactly are they seeing in politicians like Ocasio-Cortez and Obama? Good-looks? Effective speaking style? Simple language? Sophisticated language? For some subjects, the popular literature sometimes offers more valuable insights than the academic literature. The study of charisma may be one of those examples. Charisma, the research construct, is elusive. Charisma, the real-life tool to gain friends and win elections, is far more interesting. One source I’ve used frequently for finding video examples of effective leadership techniques is YouTube vlogger Charlie Houpert. A musician by training, he offers a series of watchable educational and training videos on charisma, including how it can be taught, and examples through history on its effective use in persuading others (see his video on the ‘Five Steps required for Charismatic Leadership; here: Charisma On Command). My biggest disagreement with Houpert is his frequent use of Barack Obama as an archetype of charismatic leadership. While I don’t dispute Obama’s considerable charismatic skills, particularly given the substantive hurdles he faced in 2008, the tallest being the need to convince a large number of white Democrats that a African-American could be elected president, I do argue that Obama’s charismatic skills were insufficient once he was elected president. Therefore, I will borrow Houpert’s 5-step schema for describing charismatic leadership, but offer more appropriate examples of their real-life implementation. Step 1: Explain the problem, simply. Portray the status quo as something negative that needs to be changed through a specific series of actions. Bill Clinton was a master at explaining a current problem in an easily accessible manner that his audience would understand. The following video from a 1992 presidential debate between Bill Clinton and George H. W. Bush represents a masterful use of this first charismatic leadership step. I didn’t experience John F. Kennedy’s nor FDR’s presidencies directly, but for my money, Bill Clinton is the most charismatic politician I’ve ever witnessed and his greatest skill was describing problems in ways voters understood. Step 2: Preemptively address critiques. Handle criticisms of these proposed actions before they are raised by others. The risk with step is that a politician doesn’t want to put too much emphasis on the criticisms, as that could backfire. But handling counter-arguments sooner rather than later is a communication technique employed by the best politicians of our time, particularly those confident in their own ideas. As a video example, I will use the same one offered by Houpert in his video blog on charismatic leadership. In the video below, Obama is reacting to a mass shooting in Oregon and prepares to outline, generally, a plan to address gun violence in America. In doing so, he first outlines the common arguments against gun control. And when done well it is not simply a ‘straw man’ set up but rather a means to acknowledge the valid opinions of gun control opponents. Though not often called charismatic, one of Hillary Clinton’s best rhetorical techniques is to give both sides of an argument as a part of a process to reveal her own policy stance. Often this communication technique was derided by political pundits as it made her seem ‘wishy-washy’ and noncommittal on important issues; but, in many cases she was genuinely trying to capture the complexity of an issue — ala Bill Clinton. Step 3: Give people ownership of your argument. Since resisting change is human nature, a charismatic leader will portray solutions as being consistent with a person’s current identity. For example, to convince pro-guns rights Americans to support stronger gun laws, you don’t need to convince them to become pacifists. Instead, let them know that who they are now is consistent with supporting stronger gun laws. It is called coalition building and charismatics are better at it than the average person. It is in sharp contrast to identity politics which typically divides voters into mutually exclusive groups (‘Us’ versus ‘Them’). Dividing voters is what demagogues do, not charismatics. And no politician excelled more than Jesse Jackson at using the language of coalition building to address potential voters. There is a reason he called it the Rainbow Coalition, though the expectation in the mainstream media at the time of his 1984 presidential candidacy was that he would be divisive (‘a demagogue’) that would ultimately hurt the Democrats in the general election. Mondale did get crushed in Reagan’s historic 1984 landslide, but not because of Jesse Jackson, whose candidacy directly paved the way for Obama’s victory in 2008. The following video is from a Jackson speech in Madison, Wisconsin in 2011 on the 43rd anniversary of Martin Luther King’s assassination midst a growing movement within the state opposing the policies of Wisconsin Governor Scott Walker. Though his energy level was not what is was during his 1984 and 1988 presidential campaigns, his inclusive tone had not changed. In this speech, Jackson doesn’t just list the social groups aggrieved by Gov. Walker’s policies, as if they were mutually exclusive categories, but consciously tied them together into a broader collective — a coalition of African-Americans, Latinos, Whites, sanitation workers, peace activists, and others. His speech is simple, repetitive, and inclusive. That is how charismatic leaders talk. I said previously that Bill Clinton was the most charismatic politician of my lifetime. I amend that statement by making Bill Clinton number 1A and Jesse Jacksonn 1B. Like no other politician, Clinton could weave statistics and facts into a causal model that was relatable and easy to understand — but Jackson understood pacing and tone better and delivered much more inspiring speeches. Step 5: Make the ask. Politics is a sales-oriented business. People will not change their behavior or actions if they are not asked to do so. Charismatic leaders assertively ask voters for their vote. This should be the simplest step, but I was amazed after viewing hundreds of campaign stump speeches between 1980 to the present, that the actual ‘ask’ was more of an afterthought tagged at the end of a long speech, when it should have been more explicit. Perhaps stump speeches are not the best venues for the ‘ask’ statement? One recent and beautiful example an effective ‘ask’ statement is found in Alexandria Ocasio-Cortez’ self-written TV ad during her congressional primary race in New York City’s Bronx. She doesn’t actually make the ‘ask’ until the 2:02 mark in 2:08 minute TV ad, but by the time the potential voter hears it, the message is so clear and your biggest takeaway from the ad is her name and what she wants you to do: Vote for Alexandria Ocasio-Cortez on June 26th. That is the only thing a lot of people will remember from the ad, but that is all they need to remember. Ocasio-Cortez’ unexpected upset of Joe Crowley is one reason I wrote this current essay. She is far too new to politics to assert her charismatic skills are ready for the national stage. Her minor back-tracking on support for the Palestinian people is not a good sign. But she is damn good in her TV ad and her unscripted TV appearances have been solid. Also, she is good without a script, another charismatic characteristic I could have addressed in this essay. I probably disagree with no less than 80 percent of her policy stances. But the most frequently held canard in electoral politics is the belief that policies determine vote preferences. Don’t get me wrong. Voters do have opinions on issues and they judge candidates on issues, among many other factors. But when a true charismatic enters the political arena, you can almost throw ideology and public policy out the subway car window. People will re-align their opinions for an inspiring and transcendent candidate. I watched people do it for Donald Trump and Bernie Sanders. I don’t know if Ocasio-Cortez will be that kind of candidate in the far future (she is VERY young), but her debut on the national scene has been a good start. The Republicans would be foolish to dismiss her because of her progressive policy stances. Many Republicans did the same thing when Trump entered the party and look how that turned out. With that, I will sign off by acknowledging that I have not solved the methodological problems associated with measuring charismatic leadership. But, I do believe the five-steps mentioned above capture some of its essence. The five-steps also suggest something else about charisma that is often ignored, or even dismissed: Charisma can be taught. You don’t have to be born with it. Charisma is not good-looks. It is not merely likability. It is not just the ability to express yourself well under pressure. It is something much more multi-faceted and some current politicians have it (Nikki Haley, Ben Sasse, Kamala Harris, Tulsi Gabbard, Joe Biden), some have lost it (Chuck Schumer, Nancy Pelosi), and some never had it (Mitch McConnell, Ted Cruz, John Kerry). And it can be measured. The Imperial Presidency: Is this the beginning of its end? We can hope. Consider this question: When was the last time the U.S. Congress declared war? December 1941. World War II. Every U.S. military engagement since then has occurred without a congressional declaration of war, starting with Harry S. Truman’s police action on the Korean peninsula. From 2001 to 2016, the wars in Iraq, Afghanistan, Pakistan and Syria have cost this country around $3.6 trillion, according to Brown University researchers. In the Jones-Gabbard resolution’s favor is the Constitution itself. The War Powers Clause (Article I, Section 8, Clause 11 of the U.S. Constitution) is crystal clear on what branch of government has the explicit right to declare war: The Congress shall have power…To declare War, grant Letters of Marque and Reprisal, and make Rules concerning Captures on Land and Water. However, our U.S. Congress is populated by mostly risk-averse politicians unprepared to take ownership of our nation’s many and usually counter-productive wars. In 1950, a war-weary Congress was more than willing to relinquish its War Powers to President Truman at the onset of the Korean War. Since Truman, wars have been justified under the rubrics of national security and the fulfillment of treaty obligations, policy domains where the executive branch has firm constitutional standing. While Congress always has the power of the purse at its disposal, few in Congress are willing to cut funding for on-going military operations for fear they’d be accused of ‘cutting our military off at the knees.’ Re-election obsessed politicians aren’t going to take that chance. Not now. Not ever. The constitutional power for making war may reside with Congress, but the political power to do so is decidedly in favor of the president — at least since Truman’s Korean War. Which is why the Jones-Gabbard resolution is so important, even if it is a symbolic gesture unlikely to ever pass out of the House Armed Services committee, much less become law. Their resolution is an opening salvo from Congress in the direction of the Trump administration (and for all administrations hereafter). Presidential power must be tempered so it will again be in relative alignment with the other branches of government. At a time when the ethic of bipartisanship feels more appropriate for a drippy, contrived message in a Disney movie than a political discussion, the Jones-Gabbard House bill represents what may be a growing congressional movement— finding material ways to limit the power of a presidency currently in the hands of a man the Washington establishment and half of the American public considers a palpable threat to our national interests and security. Donald Trump is not a Russian intelligence asset. That belief is the product of a modern, virulent form of McCarthyism whose proponents will soon face their own day of reckoning. Thank God, a long overdue conversation is starting in this country about the risks of what historian Arthur Schlesinger Jr. called The Imperial Presidency, a term he penned during the Richard Nixon administration, but meant to be applicable to the executive branch since Franklin Delano Roosevelt. …all but the war-making power…which must be cut back. We’ve known of this problem since at least 1973, yet, the office has only grown more powerful. The power to make war is peerless among governmental functions. Even Congress’ nebulous power to tax and spend is politically and functionally subordinate to the power of invading a hostile country and changing its alliances and form of government. As a country, we have been comfortable with these War Powers being in the possession of either men who posed no challenge to the existing military-security establishment (LBJ, Nixon, Reagan, Clinton, Obama) or were groomed within it (Eisenhower, JFK, Carter, George H. W. Bush, George W. Bush). But no prior president comes into office as maladjusted to the office’s demands and expectations as Donald J. Trump. And, yet, his access to its War Powers are only abbreviated by the knowledge and creativity of his national security team. Even the slightest provocation by Iran tomorrow would be enough justification for Trump to start a hot war and there is very little Congress or the American people could do to stop it. If you seek to blame someone for the damage Donald Trump is capable of doing to this country (and the world), start the blame game at the feet of FDR. The executive branch grew exponentially under FDR as it addressed two existential crises: a crushing economic depression and an impending World War. Congress simply wasn’t nimble enough to address these problems, particularly with respect to the War. Fast forward to the present, Trump is the direct benefactor of FDR’s extraordinary political tools, as was every president between Truman and Obama. Now that we arguably have a rogue president — a fact I don’t completely accept but understand why some do believe this — what do we do now? Impeaching Trump is not a solution. That is a extempore salve to a bigger institutional problem — an executive branch that has grown too powerful relative to the other branches of government. There is only one long-term solution to this problem: Reduce the power of the presidency and reassert the already existing constitutional powers of the legislative branch. “It’s time we found a way to work around this presidency,” suggested former New Orleans mayor Mitch Landrieu, while appearing recently on CNN’s The Axe Files with David Axelrod. Barack Obama’s former senior adviser immediately laughed at Landrieu’s idea, and his reaction was telling. Axelrod, a political operative of a rank matched in recent times by only Karl Rove and James Carville, is part of the problem Jones and Gabbard are trying to dismantle and his dismissive attitude towards Landrieu revealed his unbowed allegiance to presidential power. And why not? It’s made him rich and a lifetime member of the Washington establishment. However, Axelrod’s political project to make a junior U.S. Senator from Illinois the most powerful man in the world was both a stunning political success (if simply winning the presidency is the measure) and a debatable failure (if tangible, durable results are the measures). Yes, Obama helped save the economy at a time when it was conceivable this country would languish in an economic depression for many years. But, even that success is tempered by the knowledge that Obama simply perpetuated and expanded economic policies developed by Wall Street banking interests and initially implemented by George W. Bush’s administration (i.e., TARP and the Federal Reserve’s quantitative easing policy). It’s not historical chance that our country is still dealing with the consequences of the Truman’s Korean conflict. Presidential-led wars never end because the political purpose they serve never ends. When they do end, it often coincides with a change in the presidential administration. Eisenhower suspended the Korean War. Nixon/Ford eventually did the same with Vietnam. Obama effectively pulled the U.S. out of Iraq (George W. Bush’s war) only to start his own military adventures in Syria, Yemen and Libya (among others). These executive-initiated wars rarely represent, or even need, the independent will of the people and, instead, gain their popular support through the imaginary independence of the mainstream media which often has a greater incentive than the president to push for a new, marketable American war. The U.S. has been in a constant state of war since 9/11. Some might even argue we haven’t stopped fighting wars since V-J Day. The Jones-Gabbard resolution will not stop that fact anytime soon. Presidential power in the age of Trump is still unbowed. It will take an assertive Congress and an clear-eyed American public to turn this ship around. The Jones-Gabbard House Resolution 922 offers hope in that regard. The election of Donald Trump on November 8, 2016, was the culmination of the greatest influence operation campaign in modern espionage history. Regardless of whether Russia’s interference in the 2016 election changed the outcome (and I do believe it had an impact, though not decisive, based on my research found here), the mere fact that U.S. lawmakers continue to obsess about Russian meddling — at the expense of other major problems facing the country— is testament to the Russian influence operation’s…well, influence. The Mueller investigation’s conspiracy indictment of 12 Russian military intelligence (GRU) personnel for hacking Democratic National Committee (DNC) and John Podesta emails only highlights the long-established ability of the Russians to do more with less. When the U.S. builds a $17 billion aircraft carrier, Russia responds with a nearly-unstoppable $3 million missile to destroy it. That’s how Russia stays in the game. According to the Mueller indictment, using relatively inexpensive hacking tools at their disposal, the Russian’s attempted to alter the outcome of the 2016 presidential election in favor of Donald Trump. And what is startling is that the U.S. intelligence community (IC) and senior Obama officials knew generally of the Russians’ covert efforts but were still debating the scope and nature of those efforts right up until election day. Apart from Obama directly telling Vladimir Putin in September 2016 to stop the election interference, little else was done to stop it. In fact, it appears the FBI and the other intelligence agencies were more focused on catching the Trump campaign colluding with the Russians than impeding Russian interference. So why haven’t people in our intelligence community (IC) and executive branch been admonished for their role in failing to stop this Russian attack on our electoral system, perhaps the most vital component of the American democracy? The U.S. intelligence community’s (IC) budget is larger than the defense spending of every nation except the US, China, and Russia, and it has been this big for a long time. Yet, apart from tracking Russia’s cyber activities leading up to the Nov. 8th election, the IC did little to inform anyone of this meddling other than sharing intelligence with only high-ranking Obama officials — who failed to act on the information beyond opening a counter-intelligence investigation against the Trump campaign and President Obama’s private scolding of Putin. Even congressional leaders were largely in the dark up until the final month of the campaign when the Steele dossier was leaked to the press and the Clinton campaign issued instructions to their friendly media outlets to only mention the hacked emails in the context of Russian hacking. Regardless of whether it was the decisive factor, the Russian influence operation achieved its ultimate goal: a Trump presidency. Given the $70 billion this country spends on intelligence each year, how do we explain this outcome? Well, very easy. There are at least two reasons this happened. First, the Obama administration let political considerations outweigh the larger national interest. By the administration’s own admission, they decided a confrontation with the Russians during an election season would likely appear partisan and benefit the Trump candidacy, and that was a risk they weren’t willing to take. As long as the administration thought Clinton would win, Russia’s threat to the integrity of our national elections was acceptable and could be cleaned up diplomatically on the election’s back-end. Even after the hacked DNC and Podesta emails were released on the DCLeaks and Wikileaks websites, the substantive impact on the presidential race appeared minimal, according to the aggregate polling data widely available at the time. Post the party conventions, it was only after a media obsession over Clinton’s health and the Clinton Foundation in September that Trump began to appear like a viable candidate in the polling data. And that surge faded after his debate debacles. 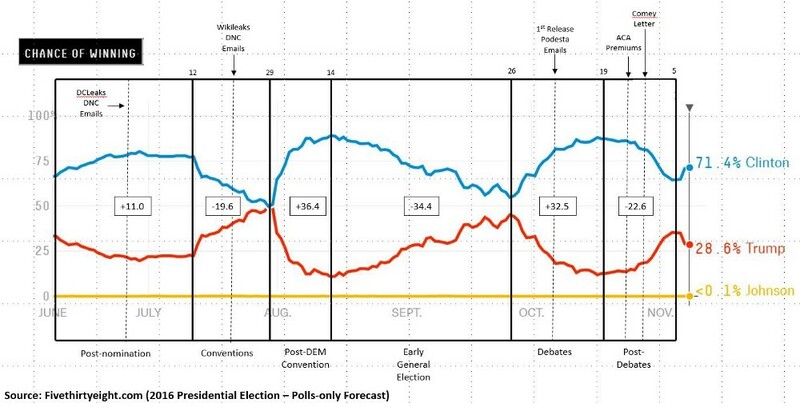 In the graph below, derived from RealClearPolitics.com’s 2016 election forecasting model, the impact on the election by the release of the DNC emails through DCLeaks (in late June) and Wikileaks (in mid-July) is confounded by other events, particularly the party conventions. While it is tempting to blame the DCLeaks and Wikileaks email releases for Hillary Clinton’s 20-point drop in her probability of winning, such a conclusion ignores the likely impact of the Republican National Convention during this period. Furthermore, the strong bounce Clinton received coming out of the Democratic National Convention in late July far surpassed the decline she experienced immediately after the DNC emails were released. The next major release of hacked emails were in mid-October when Wikileaks started a timed release of the Podesta emails. Again, immediately after the Podesta emails started appearing, Clinton’s win probability went up, not down. Similar to the national convention period in July, the impact of the Podesta emails is confounded by the three candidate debates in which Clinton was generally viewed as the clear winner. Clinton’s poll numbers (and win probability) didn’t start declining until the release of the news on premium hikes for Obamacare on October 23rd and the James Comey letter about a week after that. This visual analysis of the RealClearPolitics’ win probability data does not rule out the possible impact of the hacked DNC and Podesta emails on the final outcome. The hacked emails may have acted as a cumulative drag on Clinton’s polling numbers such that her popularity surges after the convention and the debates were not as strong as they otherwise would have been. But the graph does support the contention that the Obama administration may not have been in a panic over the DNC and Podesta email releases given the polling data they possessed at the time. Why screw up Clinton’s likely election victory with an aggressive, anti-Russian counter campaign that might backfire? Even a covert effort to shut down probable Russian trolls could become public and inspire a significant backlash. The Obama administration reasoned: Why take the chance? She was going to win anyway. The second reason the IC failed to recognize the severity of the Russia cyber attack may have been its over-reliance on classified intelligence, such a signals intelligence (SIGINT) and human intelligence (HUMINT); when, in reality, the evidence of Russian interference was readily available through more mundane open source intelligence (OSINT) channels. The Strategic Communications Centre of Excellence, a NATO-affiliated organization based in Riga, Latvia. issued a public report in 2014 on Russia’s disinformation campaign against Ukraine in which it identified themes that Russia would use against the U.S. two years later. The report even detailed the specific methods Russia used in spreading the disinformation, including creating falsely-identified Facebook and Twitter accounts controlled by Russian intelligence operatives. Ben Nimmo, a senior fellow at the Atlantic Council’s Digital Forensic Research Lab in Edinborough, Scotland identified Russian intelligence-sourced social media accounts during the 2014 Scottish independence referendum. The cyber-threat research being done by the Atlantic Council and the Strategic Communications Centre of Excellence, among many others, is in the public domain, yet, we have been told repeatedly by former Obama officials that the U.S. was caught by surprise at the scope and intensity of the Russian election interference. In her view, the systematic devaluation of OSINT by the IC is an even graver problem at a time when Russia and China actively use social media as a major platform for their disinformation operations. “Unless FBI agents and American intelligence officers get over this bias, they will continue asking for special powers to snoop on Internet users in ways that should not be allowed,” warns Priest. Ironically, the joint congressional inquiries into the intelligence failures surrounding 9/11 and the Iraq WMDs issued similar admonitions when they concluded U.S. intelligence failures are more likely to occur when (1) intelligence is politicized, and when (2) the IC becomes too reliant on classified intelligence sources when more cost-effective open source material would have revealed similar information. This preference for classified intelligence creates a ‘cloak-and-dagger’ atmosphere in the IC where critical information gets excessively sheltered and kept from policymakers and law enforcement officials that actually need the information. Politicized intelligence kept from the people that needed it most, including the American people, is the real tragedy of the 2016 election. Starting with the Japanese surprise attack on Pearl Harbor in 1941, the U.S. has arguably experienced 12 major intelligence failures, including Russia’s interference in the 2016 presidential election. The list includes: Pearl Harbor, the Bay of Pigs, the Cuban Missile Crisis, the Tet Offensive, the Yom Kippur War, the Iranian Revolution, the Soviet invasion of Afghanistan, the collapse of the Soviet Union, the Indian nuclear bomb test, the 9/11 attacks, the search for weapons of mass destruction in Iraq, and Russia’s meddling in the 2016 election. What do most of these intelligence failures have in common? With the exception of Russia’s meddling in the 2016 election, all of these intelligence failures prompted internal inquiries into U.S. intelligence’s processes with the specific goals of understanding why these failures occurred and how they can be avoided in the future. Unfortunately, the government doesn’t always share those critiques with the American people. In the case of the most egregious intelligence errors, such as Pearl Harbor, the 9/11 attacks and the intelligence on WMDs in Iraq, joint congressional hearings have been conducted resulting in the public release of key findings and recommendations. But in the case of the April 1961 Bay of Pigs operation conducted at the beginning of John F. Kennedy’s administration, an investigation led by General Maxwell D. Taylor at the behest of the president was initiated on April 22nd, only three days after the end of the CIA’s failed invasion of Cuba. The classified Taylor Commission Report was issued on June 13th; however, the unclassified version was not publicly released until December 1984 — almost 24 years after the invasion. We now know with Rachel Maddow-like certainty, the CIA really f**ked up. As worthwhile as Priests’ suggestions are, they come up short in one respect: with an intelligence failure on this scale, people and agencies must face the public. Call it a public flogging without any actual flogging. Nothing gets the creative juices flowing in an entrenched ‘deep state’ bureaucrat like seeing their reputation maligned in a public forum. The seeming ubiquitousness of former CIA Director John Brennan and former Director of National Intelligence James Clapper on cable news shows since Trump’s inauguration may not be merely for patriotic reasons. From what the Mueller investigation has revealed so far with respect to Russia’s covert activities in the 2016 election, the IC was not blind to what the Russians were doing (amplifying fake news through social media; disseminating hacked emails through third-party websites such as Wikileaks, etc.) and how they were doing it (creating falsely-identified social media accounts; cyber attacks on email servers). Yet, apart from only the most senior Obama administration officials, this information was largely kept secret. Was he kidding? The U.S. wrote the playbook on cyber attacks. Brennan should know that. Certainly the man to his immediate left on the Aspen stage, James Clapper, should have known given he was the Under Secretary of Defense for Intelligence from 2007 to 2010 at a crucial time when the U.S. began standing up its own cyber operations command. The U.S. invented and perfected cyber warfare’s core methods: phishing attacks, denial-of-service (DoS) attacks, malware, automated password attacks, drive-by downloads, “man-in-the-middle” attacks, and many more. But in 2015 and 2016, Brennan and Clapper couldn’t envision the Russians stealing sensitive emails and disseminating them across the internet to the embarrassment of select U.S. political figures? Or creating fake social media accounts to spread disinformation to American voters? So far, none of the techniques used by Russia in their election interference campaigns (which include attacks on Britain’s 2016 Brexit vote and the Scottish independence referendum in 2014, among others) are outside the U.S.’s own cyber capabilities. And the laundering of hacked emails through friendly journalists and third-party websites like Wikileaks has a long history that could not possibly have been a ‘surprise’ to Brennan and Clapper. The Panama Papers, the leaking of 11.5 million documents in 2015 disclosing financial and attorney–client information for more than 214,488 offshore entities, mirrors the DNC/Podesta email hacks. Coincidentally, close associates of Russian President Vladimir Putin were personally embarrassed by the Panama Papers and Putin’s own spokesperson Dmitry Peskov said their being leaked to the public were part of a conspiracy against Russia orchestrated by the Central Intelligence Agency and hinted the Russians would reply in kind. Yikes! Maybe Brennan and Clapper should have been reading more transcripts from Peskov media interviews in 2015? That Brennan could say with a straight face that the Russians were using a new playbook in their 2016 election meddling is preposterous. He is either incompetent or lying. Or both. If there ever is a full inquiry into the mistakes made by the Obama administration during the 2016 election, it is a fair bet much of the blame will lay directly at the feet of Brennan and Clapper, along with a president so intimidated by Putin that he choked when there was still time to expose the Russian meddling before the Nov. 8th election. Don’t mistake this criticism of the Obama administration as a blanket exoneration of the amateurish deering-dos of the 2016 Trump campaign. Trump’s campaign was a whirling dervish of a mess from beginning to end. And they still won. That fact gnaws at my attempts to explain the Trump victory. How could such an incompetent crew of New York real estate turds beat the most powerful political machine in the world? The 2016 election notwithstanding, I continue to believe winning presidential elections requires competent people. Corey Lewandowski, Donald Trump Jr., Jared Kushner, George Papadopoulos, and Carter Page don’t fit the profile. At least Paul Manafort and Roger Stone brought with them presidential campaign experience, though in a kind of skeevey and thievey sort of way. And I will always respect Kellyanne Conway’s expertise in strategic communications and marketing. She was a competent woman air-dropped into a moronic frat boy culture and proved she is capable of directing a winning presidential campaign. But, in my heart, I still believe the Trump campaign had outside help to pull off what they did. And I am not at all convinced it was anything the Russians did. As noted earlier, there is no evidence that the hacked DNC and Podesta emails changed many votes in the aggregate. Furthermore, the Russians spent peanuts compared to the other big players in the 2016 election. Their social media memes were amateur-looking and violated nearly every aesthetic standard in print and digital advertising. If Russia efforts made Trump president, then it is way too easy to become president. The Russians, at best, augmented Cambridge Analytica’s efforts in the margins; though, as yet, no hard evidence exists to suggest Cambridge Analytica was linked to the Russians. Jared Kushner might know. Someone should ask him. Hopefully, once the anti-Russia hysteria generated by the mainstream media’s coverage of the Mueller investigation dies down, serious journalists and intelligence analysts will ponder the far more important questions: Why was U.S. intelligence so tardy in discovering and impotent in stopping the Russian election meddling in 2016? 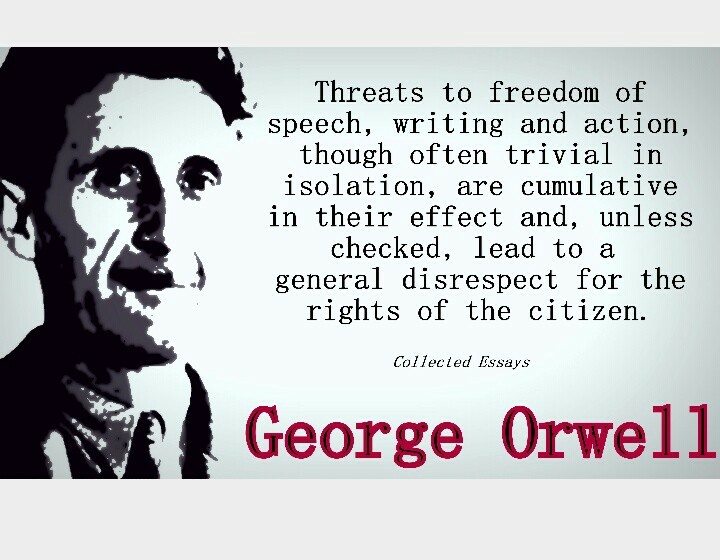 And what can we do in the future, without compromising free speech, to avoid this happening again? Between Rep. Louie Gohmert’s (R-TX) indecorous use of Strzok’s extramarital affair with fellow FBI agent Lisa Page for public shaming purposes to Rep. Steve Cohen’s (D-TN) equally inappropriate suggestion Strzok deserved a purple heart, the House hearing offered little new information about the FBI’s investigation into Russian meddling in the 2016 election. Did Strzok’s personal bias affect either FBI investigation? First, we have the Republican’s contention that Strzok’s clear bias against Donald Trump affected his work as the FBI lead in both the Hillary Clinton email and Russian election meddling investigations. While that answer may not be sufficient for pundits at the Fox News Channel, from my experience working for an Inspector General in a U.S. intelligence agency, Strzok’s defense is entirely credible. Across the dozens of investigators, auditors and inspectors I worked with on a daily basis, almost all of whom at some point expressed partisan views. It is not only human nature to have opinions, but among the highly educated and experienced professionals I worked with in the U.S. intelligence community (IC), strong partisan opinions were often expressed in our daily office conversations. And among those openly expressed opinions, included on occasion were comments about subjects of open investigations. Being committed to the integrity of an FBI investigation and also believing Trump was not qualified to be president are not mutually exclusive states of mind. Both can exist within the same person. But across all of the highly-opinionated investigators and inspectors I worked with in the IC, did I ever witness or hear secondhand evidence of partisan bias changing the results of an investigation? Why? Because the procedures, rules and norms imposed upon mid-level and high-mid-level career bureaucrats in our government’s Inspector General and criminal investigation offices are too strong and too absolute to allow otherwise. If there is a bias at the FBI, it is an institutional bias against accusing high-ranked public officials of criminal behavior. It is, ironically, a bias that will most likely work in Trump’s personal favor in Robert Mueller’s investigation. For this reason, I find Strzok’s public testimony on his impartiality with respect to the Clinton and Russia-Trump investigations to be not only plausible, but most probable. If Strzok wanted to end Trump’s candidacy, why not leak to the press? Ironically, it is The Washington Post’s own reporting that answers the question as to why FBI agents didn’t leak knowledge of Russian meddling in favor of Trump’s candidacy. In an election where Hillary Clinton was the clear favorite to win the election right up until election night, the last thing the Obama administration wanted to do was give the Trump campaign ammunition that suggested the Democrats were conspiring to undercut his candidacy. The leak likely would have backfired. Besides, Clinton was destined to win — why take the risk? In June and July of 2016, DCLeaks and Wikileaks dumped 20,000 Democratic National Committee and Clinton campaign emails online. By late July, the FBI “officially” opened an investigation of the Trump campaign’s contact with Russian officials. Why isn’t there a congressional investigation into the Obama administration’s breath-taking incompetence in stopping the Russian election meddling? Comey himself wanted to publicly announce FBI counter-measures to the Russian election interference according to Newsweek. “Two sources with knowledge about the matter told Newsweek that Obama administration officials blocked the effort,” according to a National Public Radio news report. Again, where’s the investigation into the Obama administration? Based on all available public information, Strzok did his job and committed no crime. But that is the problem. When Obama’s Department of Justice (DOJ), under Attorney General Loretta Lynch’s leadership, effectively narrowed the scope of the Clinton email investigation to whether Clinton criminally mishandled classified material, they changed the final outcome of the investigation. By excluding any substantive inquiry into the destruction of subpoenaed government records (i.e., Clinton’s 30,000+ deleted emails), the DoJ guaranteed the FBI investigation would not end in an indictment of Clinton or any of her associates. At one point during the FBI’s 2016 interview with Clinton’s chief of staff, Cheryl Mills, an FBI investigator did in fact ask about the decision rules used to identify and exclude Clinton’s 30,000+ ‘personal’ emails from public release, prompting Mills to walk out of the interview. The Clinton campaign and DoJ’s public explanation on Mills’ walk-out was that she was protected from testifying regarding the email selection method due to attorney-client privilege. But there is no attorney-client privilege if the attorney is also committing criminal act, and the destruction of Clinton’s subpoenaed government records was a criminal act. Where the criminal mishandling of classified material requires evidence of gross negligence or intent, destroying subpoenaed government records simply requires evidence that the records were destroyed and that the subject knew of their destruction. Proving gross negligence or intent has a high evidentiary threshold compared to proving that someone was involved in the destruction of subpoenaed evidence (an felony obstruction of justice crime). When Lynch forbade the FBI investigators to even ask Clinton or her associates about events leading up to the destruction of over 30,000 emails, the ‘fix was in’ and the investigation’s final outcome was not going to include a Clinton indictment. Here’s the problem for Clinton’s critics…limiting the scope of the Clinton email investigation was well within the DoJ’s right to exercise prosecutorial discretion. If before an investigation starts, prosecutors are convinced certain crimes will be hard to prove, it is within their right to exclude investigations into those crimes. That doesn’t mean the crimes didn’t happen. It just means prosecutors chose not to burn resources where an indictment is unlikely. But that doesn’t make it right, especially when the evidence for the destruction of subpoenaed government records was well-known. As for the Trump-Russia probe, with the new indictments against 12 Russian’s involved in illegal hacking, the broad outline is now appearing on how the Mueller investigation will end. By many accounts now, Mueller is focusing on Trump senior adviser Roger Stone and his connection to Russian operatives connected to the email hacks. While it is not a crime to engage in Twitter conversations with Russian hackers, Mueller’s team is looking for evidence that Stone coordinated with the Russians on how and when to disseminate the hacked emails in order to maximize their impact. Even that might not be a crime, but it is close enough to warrant Mueller’s attention. Unfortunately for Trump’s critics, even if Stone did coordinate with the Russians, it is not clear how that would connect directly to Trump and thereby become an impeachable offense. Trump’s biggest vulnerability remains in obstructing the Mueller probe, not in personally colluding with the Russians. As for Strzok, he is nothing more than a cog in the wheel of a sprawling federal bureaucracy dedicated to preserving the interests of the Washington, D.C. establishment. It would have been nice if the Republicans during Thursday’s hearing had pressed Strzok to enlighten us on how early and extensively in the election the FBI started running informants against the Trump campaign. As it stands today, the American public and Congress remain in the dark about exactly what prompted the FBI to start throwing informants at the Trump campaign well before opening the Crossfire Hurricane counter-intelligence investigation in late July 2016. It no longer seems credible that it was George Papadopoulos, a low-level Trump campaign operative, spilling the collusion beans to an Australian diplomat. But I bet Pete Strzok knows. And he’s not telling. At least not yet. With President Donald Trump’s selection of U. S. Court of Appeals Judge Brett Kavanaugh to replacing retiring U.S. Supreme Court Judge Anthony Kennedy, the hyperbole from both Democrats and Republicans will be unbearable for the next few months. “I wish him a speedy confirmation; there is literally nothing in his record that justifies the smears and demagoguery he’s about to face,” adds Shapiro. Opposition to Kavanaugh’s ascension to the Supreme Court will pivot largely on one issue: abortion. With the addition of Kavanaugh to the John Roberts Court, the assumption by many observers is that the Court will be primed and ready to strike down 1973’s Roe v. Wade ruling that said a woman’s right to privacy extended to the unborn child she was carrying and thereby made abortion legal in many circumstances. “What Roe (and Casey) do is prevent the states and Americans from having a say in this important public policy debate, resulting in a regime so extreme that only six other nations in the world (Canada, China, Netherlands, North Korea, Singapore, and Vietnam) have as permissive abortions laws as the United States,” adds Cleveland. While Democratic Senate minority leader Chuck Schumer says he will fight the Kavanaugh nomination with ‘everything I have,’ as the days have passed since Trump’s announcement, more and more Democrats are privately conceding it is better to let the nomination go through and make it a rallying cry for Democratic candidates in the midterms. Kavanaugh will be confirmed. The numbers are simply against the Democrats, who need to win more presidential and U.S. Senate elections if they want to control Supreme Court appointments in the future. While the rhetoric is guaranteed to get white-hot over the Kavanaugh nomination, there is also a genuine opportunity for the media and policy experts to bring real context and understanding to the abortion issue. Abortion is not merely a medical procedure, it is a public policy superimposed on social norms, legal and political institutions, a free market economic system, and religious beliefs. It is not just about women’s control over their bodies. It is not just about morality and the sanctity of life. It is about all of these elements taken together — not in isolation. For pro-life advocates to ignore the constitutional rights of a pregnant woman, independent of her baby’s development stage, is equally misguided and unproductive. Absolutist arguments on abortion fail to capture reality. And in formulating public policy, that problem can turn policies into malignancies. In Roe v Wade, the ‘compromise’ was to create the legal concept of ‘viability.’ In the Court’s 1973 ruling, once an unborn child is viable (considered to be about 28 weeks at the time of ruling), the states can impose restrictions on abortion rights in defense of the child’s legal rights. In essence, the court was attempting to answer the question: When does an unborn child gain their constitutional rights? The Burger Court’s answer to that question in 1973 did not end that debate, but rather launched it. The multi-dimensional aspect of abortion rights becomes apparent when viewed across the globe and might offer some guidance (and warnings) to political leaders on how to address the core demands from both sides of the issue: (1) protect the right of women to control their own bodies, and (2) protect the inalienable human rights of the unborn. It should not surprise us that there is significant variation in abortion rights across the world. The academic literature generally agrees that abortion rights are a direct function of women’s status in society. By definition, that may be true. However, when abortion rights are viewed globally, one must look beyond women’s status to understand why some countries, like the U.S. and Turkey, have permissive abortion laws while others, such as Poland and the Philippines, have much more restrictive laws. The above world map created by the reproductive rights advocacy group, the Guttmacher Institute, shows this variation in worldwide abortion laws and highlights the difficulty in using simple explanations to describe this variation. For example, countries near the equator generally have more restrictive abortion laws, with the exception of countries such as Vietnam, Cuba and India where the laws are less restrictive. This apparent geographic relationship also mirrors the division of advanced economies from rapidly developing and less-advanced economies. But a world map of religious cultures would also appear correlated with abortion laws, as would a mapping of women’s status. Yet, there are Muslim-majority countries (Tunisia, Turkey) with permissive abortion laws, and others with very strict restrictions (Egypt, Iraq). France and Italy, Catholic-majority countries, have few restrictions on abortion, while Catholic-majority Poland and Ireland limit abortions to cases where the mother’s health is at stake. So, is it geography, the dominant religious culture, women’s status, economic development, or the political system driving abortion laws? Is it all these factors? Or, perhaps, there is something more fundamental underlying these cross-national differences? 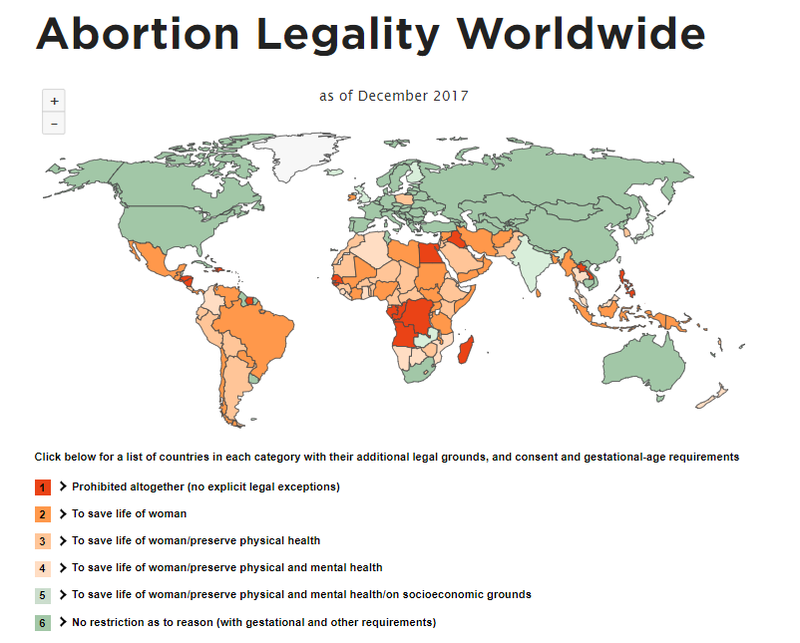 In a purely exploratory look at abortion laws worldwide with the hope of finding clues about what factors may drive the differences we see across countries, I collected recent data (2015–2017) on a range of key variables found to be (or hypothesized to be) significant correlates with national abortion laws. The dependent variable was constructed using the Guttmacher Institute’s six-level index on worldwide abortion laws and adding a seventh level for countries identified by the Charlotte Lozier Institute as having the most permissive abortion laws in the world (Canada, China, Netherlands, North Korea, Singapore, U.S., and Vietnam). There is surprisingly scant quantitative research attempting to explain cross-national variation in abortion laws; and while I do not presume my analysis here is definitive on the topic, I did try to draw ideas and constructs from a broad range of disciplines (economics, political science, sociology, social psychology, industrial organization psychology). One of the more comprehensive and recent examinations of worldwide abortion laws was conducted in 2015 by Jessica Hyne, a Masters student at the Institut Barcelona Estudis Internacionals. In her cross-sectional analysis of abortion liberalism across 192 countries found the following independent factors to be most significantly correlated with abortion liberalism: religiosity, whether or not a country is majority Catholic or Muslim, gender inequality, regional policy diffusion, human and economic development, and Communist tradition. ⚫ Freedom House’s 2018 Political Freedom Index: Hypothesis: Higher levels of political freedom should relate to more permissive abortion laws. ⚫ The Heritage Foundation’s 2018 Economic Freedom Index (and its 12 sub-indexes: Property Rights Freedom, Judicial Effectiveness, Government Integrity, Tax Burden, Gov’t Spending, Fiscal Health, Business Freedom, Labor Freedom, Monetary Freedom, Trade Freedom, Investment Freedom, and Financial Freedom): Hypotheses: Higher levels of economic freedom should relate to more permissive abortion laws. ⚫ International Monetary Fund data on GDP per capita (2017): Hypothesis: Higher levels of economic development should relate to more permissive abortion laws. ⚫ World Bank’s Gender Development Index (2015): Hypothesis: Higher levels of gender development and equity for women should relate to more permissive abortion laws. ⚫ Indicator variables for Latin American countries, African countries, majority Muslim countries, and majority Catholic countries: Hypothesis: Countries with common regional histories (particularly with respect to culture, colonialism and religion) may also share similar abortion laws. I also included the World Bank’s Human Development Index and Gender Inequality Index in my initial linear models of worldwide abortion rights, but found their explanatory contribution to be minimal in the presence of the economic freedom, political freedom, and economic development variables. They were therefore dropped in subsequent linear models and are not found in the linear model reported here. More details on the methodology, statistical model, and linear model estimates developed during this project are available in the Appendix at the end of this essay. (And the data are available on request to: kroeger98@yahoo.com). 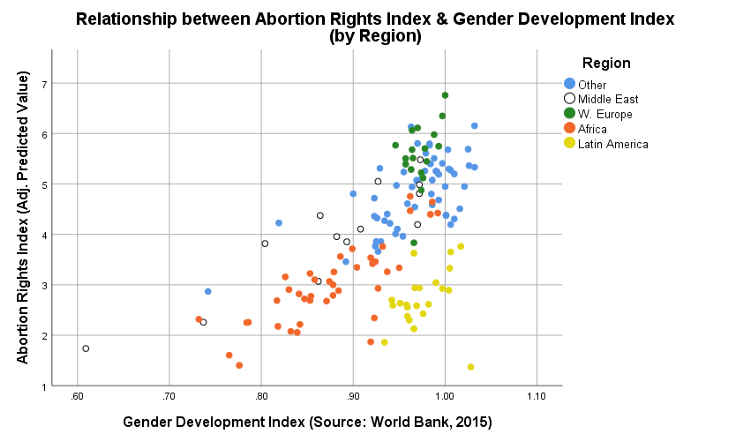 The first pair of graphs below shows the positive linear relationship between abortion rights and the World Bank’s Gender Development Index (GDI), after controlling for the other factors. 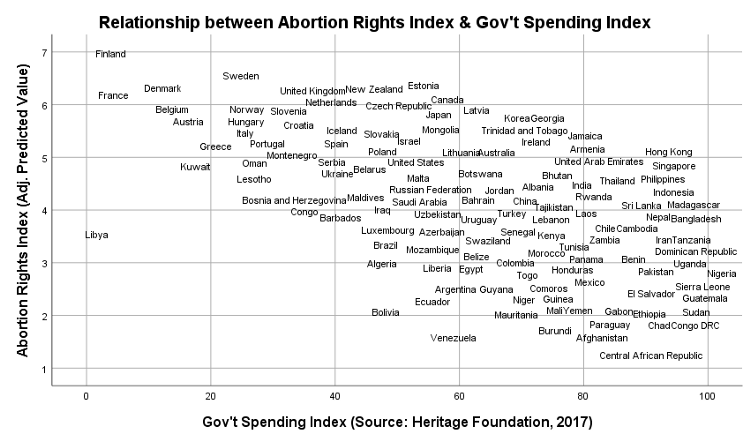 In countries with higher GDIs, such as France, Sweden, Hungary, Poland, and Ukraine, the predicted Abortion Rights Index (ARI) is significantly higher. In contrast, in countries with low GDIs — Afghanistan, Yemen, Pakistan, Chad, Algeria — the predicted ARI is significantly lower. When the data is displayed by region, African countries are seen to have low GDIs and low predicted ARIs, while West European countries are high on both indexes. 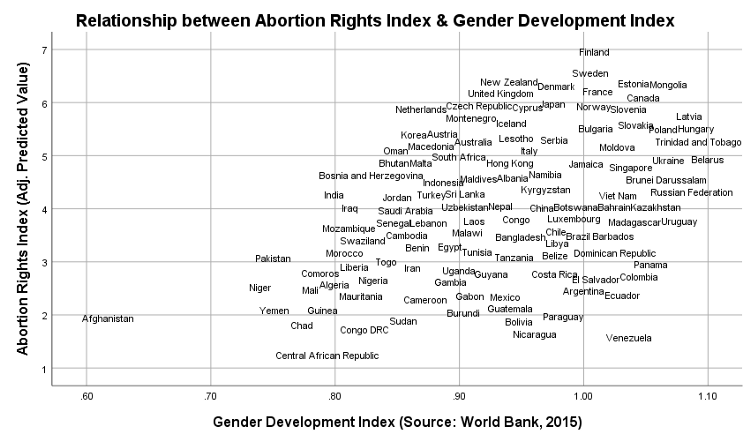 However, Latin American countries tend to have much higher GDIs than many other countries, yet, their abortion laws are still largely restrictive. 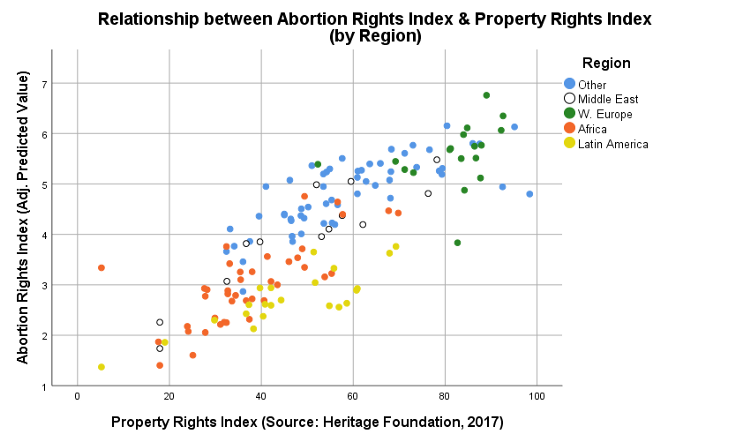 A much stronger positive and linear relationship exists between abortion rights and a country’s Property Rights Index (PRI). Where a country’s laws protect property rights, their laws also tend to be more permissive towards abortion. 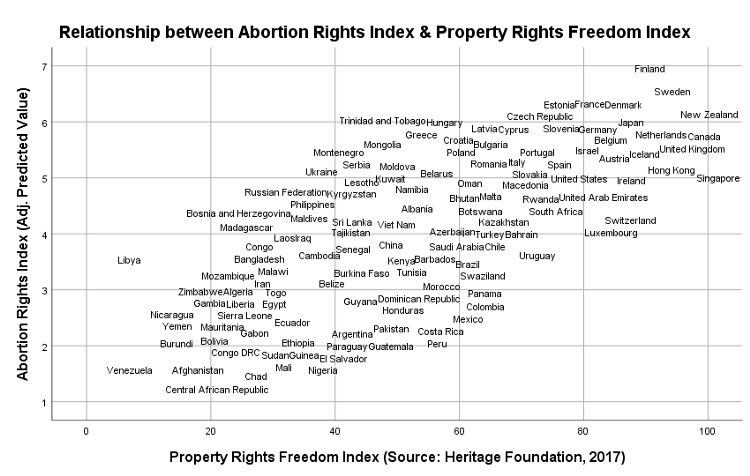 West European countries tend to index high on both abortion rights and property rights; whereas, Latin American and African countries tend to score low on both. More interesting is that the level of political freedom (the Freedom House Index), which includes information on privacy rights, does not significantly associate with the abortion rights. A more unexpected relationship exists between abortion rights and the intrusiveness of the government in the private economy. 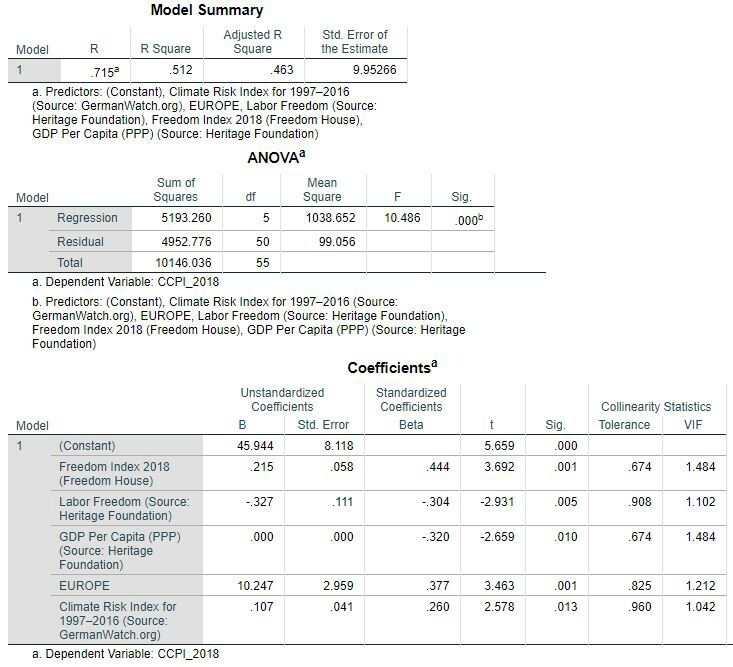 The Heritage Foundation’s Government Spending Index (GSI) is computed such that a high score indicates a country’s government is less intrusive in the private economy. Put differently, a high GSI indicates more economic freedom from the government. So why would the GSI be negatively associated with the permissiveness of abortion rights? If one examines those countries with high GSIs, they tend to be authoritarian regimes (Pakistan, Iran) and/or under-developed countries (Afghanistan, Central African Republic, Sudan, Chad). If a country is going to restrict citizens’ rights, it is much easier to do so under an authoritarian regime. But there are countries with relatively high GSIs and more restrictive abortion rights that are not easily classified as authoritarian or under-developed — countries such as Mexico, Chile, Argentina, Turkey and India. On the other end of the spectrum, the U.S., Japan, Canada and the West Europe countries have significantly more intrusive governments in the private economy and generally have permissive abortion rights. As all are democracies, the association with higher levels of reproductive freedom is not surprising — but even after controlling for political freedoms and levels of economic development (GDP per capita), the relationship between the GSI and the ARI remains strong and negative. 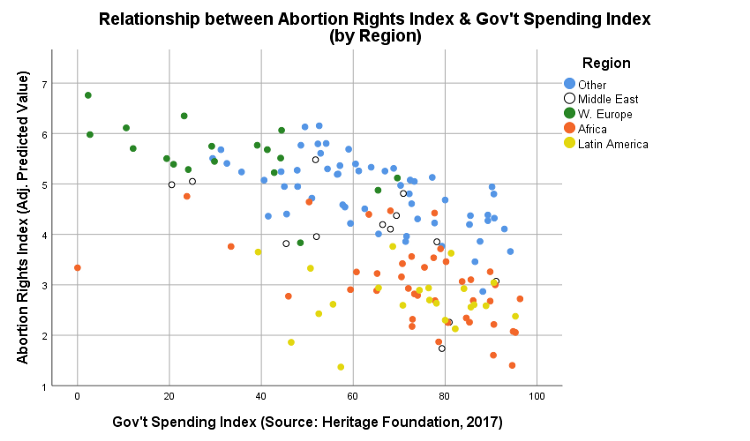 In other words, economic freedoms more than political freedoms appear more important in understanding cross-national variation in abortion rights. But even within economic freedoms, the relationship to reproductive rights is not uniform or unidirectional. Both arguments in the abortion debate contain internal contradictions that either need to be rationalized away or ignored altogether. Pro-choice Democrats must accept that permissive abortion laws guaranteeing women’s legal access to abortion are an ennoblement of one of capitalism’s most fundamental principles: private property and its promotion of economic efficiency. Legalized abortion (and birth control more generally) flourishes within free market capitalism. The economy needs productive workers, but also needs babies that turn into future productive workers. Abortion offers a direct mechanism at the individual level to more efficiently navigate the born-learn-work-breed-die life cycle. Does this mean legalized abortion is a necessary element of free market capitalism? No, of course not. Birth control is more likely the necessary element and abortion is simply its more uncivilized, dehumanizing substitute. Pro-life Republicans, however, are confronted with their own ideological contradictions on abortion policy. While they can take inspiration from knowing that freedom from government intrusion in the private economy is associated with more restrictive abortion laws, they must also accept that there is a strong relationship between strong private property rights and more permissive abortion laws. That fact does not fit so neatly into typical pro-life doctrine. I accept the pro-life thesis that human life begins at conception and possesses inalienable rights needing protection — within reason. The State of Iowa’s newly passed ‘heartbeat’ law restricting access to abortion is a grotesque over-reach that violates common sense, as many women will not even know they are pregnant until after the heartbeat is detectable, and will likely backfire on Iowa Republicans come the midterm elections. A property rights argument challenging draconian abortion laws like Iowa’s may offer more protection for women’s rights than Roe v. Wade’s reliance on privacy rights. As dehumanizing as Rausch’s argument may seem — treating a uterus as private property — it may already be the de facto rationale underlying today’s most permissive abortion laws worldwide. The cross-national data I am looking at suggests as much. (1) We don’t need the government getting involved in our private lives any more than absolutely necessary. (2) And protecting the sanctity of human life at all stages of the human life cycle is an equally admirable moral imperative. Sadly, in words and practice, both Democrats and Republicans come up far too short on both. This analysis of international abortion law employs a cross-sectional modelling approach (i.e., one point in time). While not as analytically powerful as a time-series panel design (repeated measures over time), for exploratory and descriptive purposes it offers useful insights into current differences in abortion laws across nations. While all of the sub-indexes in the Heritage Foundation’s Economic Freedom Index were tested for significance, only two were consistently significant across models: Government Spending (i.e., the size of government relative to the total economy), and Property Rights Freedom. Details on how all of the Heritage Foundations’ sub-indexes are computed can be found here. 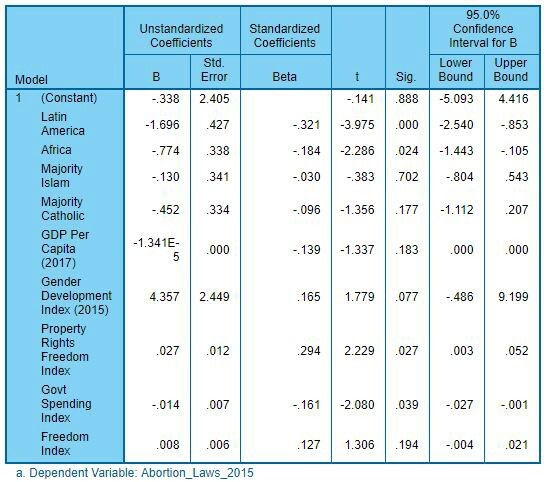 As the model fit table above indicates, the final model only explained 42 percent of the variation in abortion laws across nations, though the overall model fit statistic was highly significant (F-statistic = 12.9, prob. = 0.0001). The factors associated with international abortion laws and significant at α=.05 (95% confidence level) were: (1) an indicator for Latin American countries, (2) an indicator for African countries, (3) Property Rights Freedom, and (4) Government Spending. 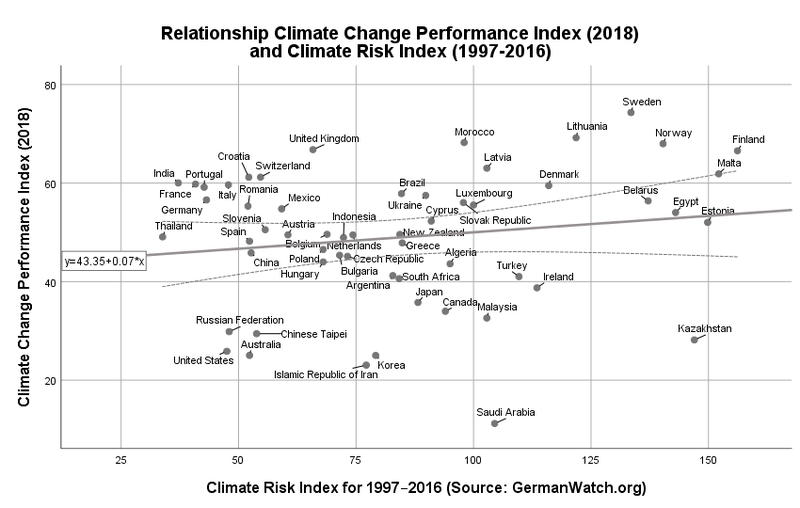 With release of GermanWatch.org’s Climate Change Performance Index for 2018, we are starting to better understand the most significant drivers and barriers facing countries trying to address climate change. (1) Addressing climate change is still predominately a European-led project. (2) Countries facing the greatest risks from climate change are less likely to implement strong climate change policies. (3) Political and social freedom is associated with stronger climate change policies. (4) However, labor freedom, has a negative impact on climate change policies. (5) And, finally, economic prosperity (as measured by GDP per capita) is still, all else equal, associated with negative climate policies and outcomes. This last finding has hampered the climate change policy debate since its inception and still stands as the biggest political barrier facing environmentalists trying to significantly change the world’s energy policies. However, the ground is shifting fast underneath the energy industry such that, within a few years, the ‘coal-is-the-cheapest-energy-source’ argument will be retired permanently. 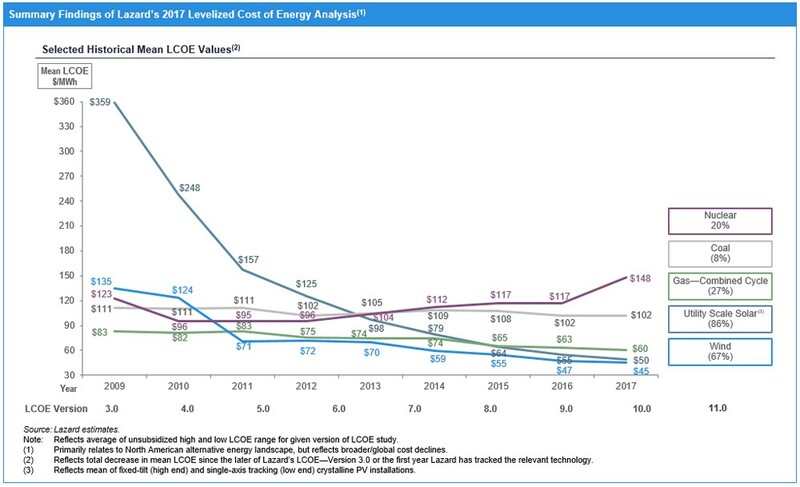 The Lazard LCOE analysis also reminds us about the remaining disadvantage of renewable energy — it is still an intermittent energy source. It is not always windy and the sun doesn’t always shine. Developed economies, like the U.S. and those in Europe, and fast-developing countries, like China and India, need a lot of energy ALL OF THE TIME and renewable energy sources cannot yet be relied upon to meet base-load electricity generation requirements. “Although alternative energy is increasingly cost-competitive and storage technology holds great promise, alternative energy systems alone will not be capable of meeting the base-load generation needs of a developed economy for the foreseeable future. Therefore, the optimal solution for many regions of the world is to use complementary conventional and alternative energy resources in a diversified generation fleet,” said the 2017 Lazard report. The problem with a ‘diversified generation fleet’ is that it creates redundancies in the energy economy. For every solar/wind plant, there must still be an existing coal, natural gas or nuclear plant capable of providing an area’s electricity needs. This will not always be true. But it is true today and that is why China and India, with rapidly increasing energy needs, are forced to build new coal plants in the near future. Once built, the economics will lean towards seeing those plants stay open for the majority of their 40-year lifespan. Until battery storage technology becomes affordable and scalable for national needs, climate change policy debates will continue to be driven by old biases and assumptions about ‘cheap coal’ and the economic damage caused by more expensive (and intermittently available) renewable energy sources. As the two largest economies (and polluters) in the world — the U.S. and China represent the genuine challenges of pursuing strong economic growth while also converting to a 100%-renewable energy economy. As mentioned, the cost-efficiency gap is closing between energy production from fossil fuels (coal, oil and gas) and renewables (solar and wind, primarily), and as that continues the growth-vs-green dilemma will fade — though, for countries with substantial domestic and fossil fuel reserves still in the ground or developing countries in the midst of rapid economic growth, this dilemma will not go away as fast as the Paris Agreement requires. The central dilemma facing negotiators for the 2016 Paris Agreement was accommodating rising economic powers — China, India, and Brazil — who were concerned that overly aggressive climate change policy goals would jeopardize their rapid economic ascension. As evidenced by Greenpeace’s recent report that China’s greenhouse gas emissions (GHGE) surged during the first quarter of 2018 due to strong growth in the Chinese economy, economic growth and the policy goals adopted in Paris remain at odds in countries like China. Leading into the 2016 Paris Agreement negotiations, a number of environmental activists, energy sector leaders, and academics met in Paris in May 2015 to review the most recent research on the supposed growth-vs-green trade-off. Their conclusions foreshadowed the findings of the 2017 Lazard LCOE analysis. Economic growth and renewable energy can be complimentary, not contradictory. If we believe the forecasts regrading the future costs of climate change (e.g., flooding, droughts, fires, etc. ), the costs associated with renewable energy’s intermittency dilemma become less problematic. But Stern may not be as sufficiently sensitive, as is China’s leadership, to any factor that may slowdown China’s still fast growing economy. As of today, China’s total debt-to-GDP ratio is at around twice the level it was at the end of 2008 (when excluding financial sector debts) and remains a sticky problem for the Chinese Communist Party (CCP). “That Chinese debt has grown to dangerous levels is beyond dispute,” wrote the editors at the Financial Times in February. However, other observers note that China’s outstanding public sector debt, valued at about $4 trillion, is dwarfed by the assets controlled by all levels of governments in China. In other words, China’s sovereign risk due to high debt is extremely low. One remedy for China’s growing debt is an even faster growing economy and that is why China’s leadership is unlikely to risk such growth by being too aggressive in converting China’s energy economy from fossil-based to renewable-based. In time, China will be the world leader in renewable energy. As of today, they can’t afford to be. Even as the growth-vs-green trade-off argument rapidly becomes obsolete, there other factors just as important working for and against the ability of signatory nations to comply with the Paris Agreement’s aggressive policy goals. First, converting the world to 100%-renewable energy is still largely a European project. The renewable energy revolution has not been embraced on a global scale yet. GermanWatch’s list of the Top 15 countries on the 2018 Climate Change Performance Index (CCPI) shows evidence of this fact. Thirteen of the Top 15 on the CCPI are European countries. The bottom 10 are even more interesting (in descending order): Canada, Malaysia, Russia, Taiwan, Kazakhstan, U.S., Australia, South Korea, Iran, and Saudi Arabia. Six of these countries are significant oil and gas producers; three are rapidly developing countries; and the apparent outlier is Australia. Using a linear model to explain variation in GermanWatch’s CCPI (see Appendix B for the model’s parameters and diagnostics), four variables (along with an indicator for European nations) proved statistically significant: Political freedom (as measured by Freedom House’s Freedom Index), climate risk exposure (as measured by GermanWatch.org), Labor Freedom (as measured by the Heritage Foundation), and economic prosperity (as measured by GDP per capital, PPP, $USD). Most encouraging is the apparent importance of political and social freedom in facilitating substantive climate policies and outcomes. As our own president often suggests, dictators and authoritarian regimes are more empowered to implement policy changes than pluralistic democracies where partisan stalemates seem the norm. In fact, the opposite is true — at least in the case of climate policy. According to the linear model’s estimates, a 1-unit increase in the Freedom Index (which ranges from 0 to 100) results, on average, in a 0.2-unit increase in the CCPI (which ranges from 0 to 100). 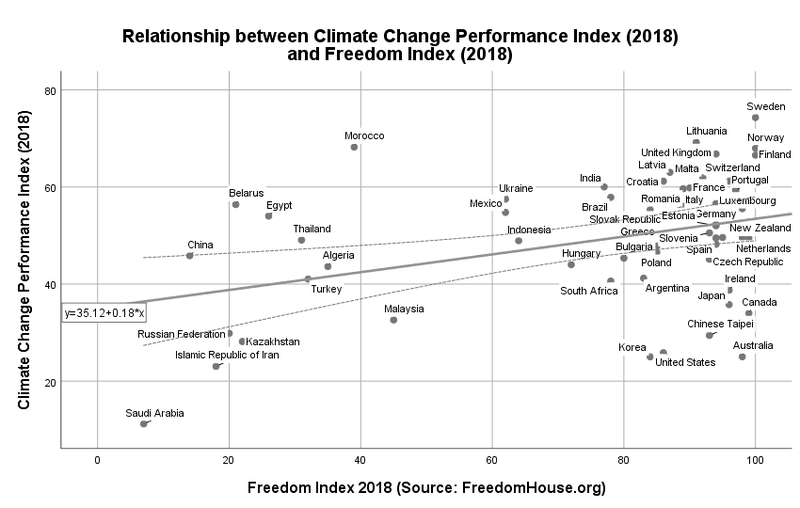 The chart below shows the bivariate relationship between the CCPI and Freedom House’s Freedom Index. The clump of countries in the upper-right-hand corner of the chart are almost all ‘free’ societies (e.g., Sweden, Norway, Finland, France, Germany, UK, etc.). And what countries disproportionately lag on the CCPI? Authoritarian regimes like Russia, Iran, Saudi Arabia, and Kazakhstan. The finding that democracy and freedom are crucial to meaningful climate policy is reaffirming. Maybe democracy hasn’t lost its relevance. But there is a downside, if you believe meeting the Paris Agreement’s goals are necessary for global survival. Many of the world’s climate laggards (and significant GHC emitters) are either authoritarian (China, Russia, Egypt, Thailand, Iran) or flawed democracies (Malaysia, Turkey, Algeria), making worldwide compliance with the Paris Agreement’s a probable fantasy. Nonetheless, any effort to promote pluralistic, democratic societies can only help in meeting the goals of the Paris Agreement. Quite surprisingly, a nation’s exposure to the consequences of climate change (e.g., hurricanes, floods, droughts, fires, etc.) 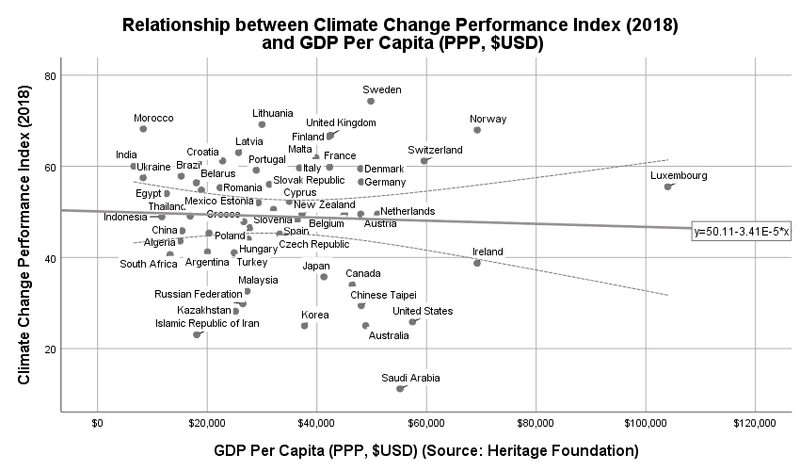 makes the country less likely to adopt progressive climate policies (see chart below). It is important to note that GermanWatch’s Climate Risk Index ranges from 0 to 100 where 0 indicates high exposure to climate change’s consequences and 100 indicates no exposure. According to the linear model’s estimates, a 1-unit increase in the Climate Risk Index results, on average, in a 0.1-unit increase in the CCPI. Such that, countries such as Finland, Sweden and Norway, who have suffered less from catastrophic climate and weather-related events between 1997 and 2016 are more likely have implemented climate policies aimed at mitigating the economic and social risks of climate change. In contrast, countries most exposed to weather catastrophes, such as the U.S., Australia and China Taipei (Taiwan), have adopted less aggressive climate policies. It should be mentioned that GermanWatch’s 57-country sample excludes many countries vulnerable to climate change (Bolivia, Bangladesh, Vietnam, Sri Lanka, most Pacific island countries) and have therefore not received CCPI scores by GermanWatch. As to how their inclusion might change the linear model results reported here, it is pure conjecture on my part, but I believe it is reasonable to assume many of those excluded countries have climate policies towards the lower end of the CCPI scale. Almost as surprising as the relationship between climate risk and the CCPI is the finding that higher levels of labor freedom are associated with lower CCPI scores. The chart below shows the bivariate relationship between the Labor Freedom Index and the CCPI. According to the linear model’s estimates, a 1-unit increase in the Labor Freedom Index results, on average, in a 0.3-unit decrease in the CCPI. Heritage Foundation’s Labor Freedom Index is measured using seven quantitative sub-measures: (1) the ratio of minimum wage to the average value added per worker, (2) the level of hindrance to hiring additional workers, (3) the rigidity of workers hours, (4) the difficulty of firing redundant employees, (5) the legally mandated notice period, (6) levels of mandatory severance pay, and (7) the labor force participation rate. So why would higher levels of labor freedom associate with less aggressive climate policies? 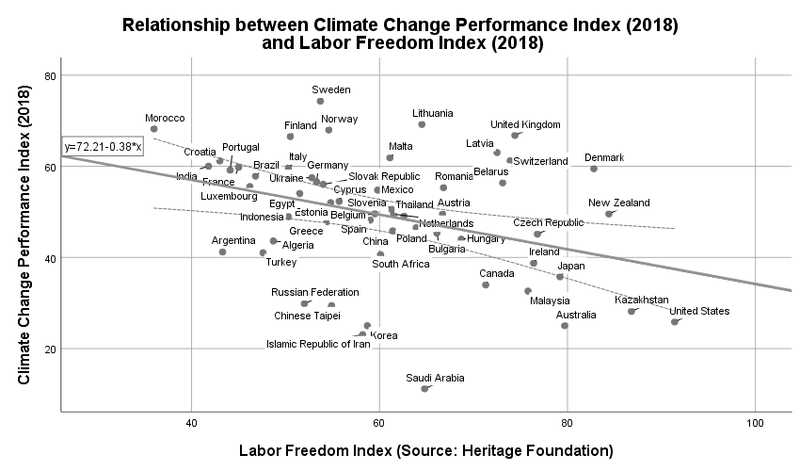 It is conjecture at this point, but to the extent that high values on Heritage’s Labor Freedom Index are related to particularly more labor freedoms for blue collar workers, it is possible such workers in the presence of such freedoms also place a lower priority on climate change policies and are able to influence public policy accordingly. This is a question to investigate more systematically in the future. As I addressed the growth-vs-green trade-off earlier in this essay, I will note from the chart below that the bivariate relationship between economic prosperity and the CCPI does not visually appear strong. But this cross-sectional analysis tells us little about the dynamic relationship that other research shows exists between economic growth (GDP annualized change) and greenhouse gas emissions. That such a relationship exists now in some countries (e.g., China) does not mandate that this relationship must continue into the future. Falling costs for large-scale renewable energy generation (as well as the higher penetration of electric cars in the more distant future) will most certainly change the growth-vs-green trade-off. For those skeptical that the world is on a path to ‘catastrophic’ levels of warming in the next 80 years, I share some of your skepticism; but, also recognize there are other important reasons — such as environmental damage and economic inequality — to end the world’s addiction to fossil fuels sooner rather than later. Converting the world’s energy supply to affordable renewable sources is an epic project that will fundamentally change the world’s current distribution of wealth and power. Which is why I find hyperpartisan climate activists so irritating. Their ‘sky-is-falling’ mantra repeatedly exposes them to legitimate criticism about the accuracy and reliability of climate science’s forecasts for global warming and its associated consequences. Doomsday predictions about humanity’s fate never materialize. New ice age? Didn’t happen. Over-population leading to hundreds of millions of people dying of starvation by 1980. Didn’t happen. Y2K would lead to mass blackouts and economic chaos. Nope. Didn’t happen either. In the late 2000s, Al Gore publicly suggested the possibility that Arctic sea ice could be completely gone during the summer by around 2013 or 2014. In a New York Magazine article, David Wallace-Wells wrote that global warming is advancing so fast that in our children’s lifetime the earth may no longer sustain us. “Most people talk as if Miami and Bangladesh still have a chance of surviving,” wrote Wallace-Wells, “The scientists I spoke with assume we’ll lose them within the century, even if we stop burning fossil fuel in the next decade. I wish to be around in 2100 to verify if Miami and Bangladesh will still exist. I am confident they will. Doomsday predictions NEVER come true. If the planet-killing asteroid doesn’t get us, however, the collapse and subsequent expansion of the Sun past earth’s orbit will. I won’t even mention the possibility of a gamma-ray burst wiping us out. The point is, global warming will not be a human extinction event and our ability to innovate and adapt to environmental changes will limit its most serious life-threatening consequences. Knowing that in no way diminishes the real dangers posed by the human-caused warming of our planet. Even if the actual warming is on the low side of the current predictions, its impact will be profound, particularly among poorer people living in arid regions or along coastal shores. Which, again, is what makes climate activists so maddening. We do not need to hear one more partisan, cable news pundit with an art history degree lecturing those who are not in a sufficient degree of panic regarding global warming. It is not just an unwarranted and slavish level of respect for current climate science (which is a relatively young science attempting to understand a complex, non-linear dynamical system), using shaming as a tool for political discourse drives climate realists (like myself) out of the debate. All that remains in the public arena are the most narrow-minded partisans (both left and right) screaming at each other, often over trivial or unprovable points of fact. The better solution is a polyrationale approach to the climate change discourse. There are many excellent reasons (unrelated to global warming) to push for a rapid transition to renewable energy. Having seen the choking, life-shortening levels of air pollution and environmental damage in Beijing and other major Chinese cities, it is absolutely imperative that China’s (and India’s) inevitable economic rise follow an environmentally sustainable path unlike the one followed by Europe and the U.S. Even as China is making great strides in reducing air pollution and improving water quality, the possibility that wealthy Chinese will leave China for ‘greener’ pastures elsewhere remains a palpable concern to the CCP. Another important reason to rapidly transition to renewable energy is facilitating a fairer worldwide distribution of wealth and power (and hopefully fewer ill-fated, budget-crushing regime change wars by the U.S. attempting to control the West’s access to the world’s fossil fuel reserves). Neither of these rationales require catastrophic predictions about global warming’s impact. Where now climate skeptics can rationalize their dismissive attitude about anthropogenic global warming every time the climate change activists exaggerate and oversell its consequences, under a polyrationale approach, a much broader political consensus is possible. In other words, as long as the public debate on global warming remains a fundamentally a partisan one, the world’s transition to renewable energy will be slower than necessary. The Climate Change Performance Index (CCPI) is an instrument designed to enhance transparency in international climate politics. Its aim is to put political and social pressure on those countries which have, up until now, failed to take ambitious action on climate protection. It also aims to highlight those countries with best practice climate policies. On the basis of standardized criteria, the index evaluates and compares the climate protection performance of 56 countries and the EU, which are together responsible for more than 90 percent of global greenhouse gas (GHG) emissions. 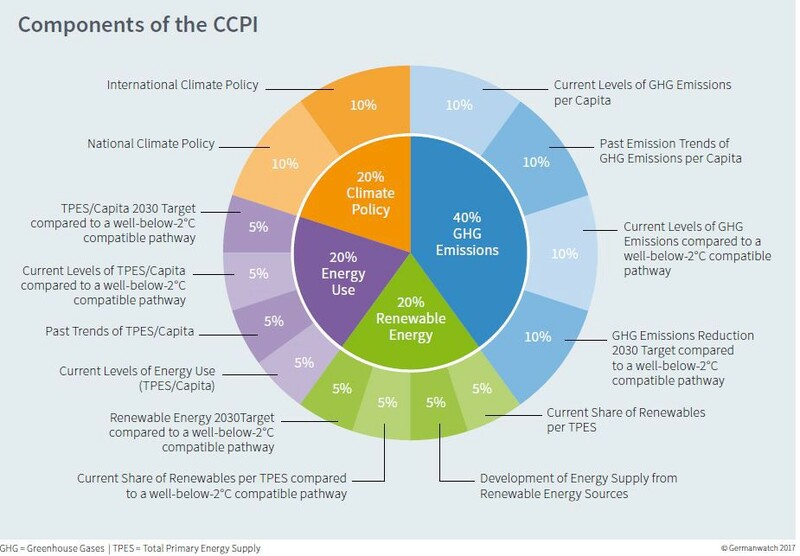 In 2017 the design of the CCPI was revised, due to recent global climate policy developments in the last years. One of the major events that marked a milestone in the international climate negotiations was the entry into force of the Paris Agreement. For the first time, it is possible to measure the performance of states based on the promises they themselves formulated in their Nationally Determined Contributions (NDCs). So far 169 Parties have ratified the Paris Agreement and promised to combat dangerous climate change in limiting global temperature rise to well-below-2°C or even 1.5° C.
The CCPI aims to capture the fulfillment of those promises and evaluates the countries’ 2030 targets within the important categories greenhouse gas emissions, renewable energy and energy use to determine, how well they are on track to a well-below-2°C pathway. The CCPI now also reflects countries’ current performances towards this pathway in absolute terms, in addition to the remaining relative indicators measuring the current level and past trends in all three categories. 40% of the evaluation is based on indicators of emissions, 20% on renewable energies and 20% on energy use. The remaining 20% of the CCPI evaluation is based on climate policy assessments by experts from the respective countries. Besides changes in the weighting and smaller modifications within the calculation method, the addition of indicators, which measure the progress of countries on their way not to overshoot the well-below-2°C limit, are the major changes in the new design. The three categories GHG Emissions, Renewable Energy and Energy Use are defined by four indicators each (recent developments, current levels and 2°C compatibility of the current performance as well as an evaluation of the countries’ 2030 targets in the respective categories). With these complements, the CCPI covers the evaluation of the countries promises as well as their current progress in terms of climate protection. I tried to jump out of my insanely comfortable TV-viewing recliner at hearing that Alexandria Ocasio-Cortez, a 28-year-old progressive and political newcomer, had defeated 10-term incumbent Rep. Joe Crowley for the Democratic nomination in New York’s 14th U.S. House district. Crowley, chairman of the House Democratic Caucus, was considered the fourth most powerful Democrat in the House chamber. To lose to a political novice was, to put it mildly, unexpected. And how did Crowley react to this sudden defeat? With one of the most gracious concession speeches I’ve ever heard. And, as he launched into a rendition of Bruce Springteen’s “Born to Run,” he dedicated it to Ocasio-Cortez in his thick Queens-accent. Imagine if Hillary Clinton could have mustered a fraction of Crowley’s class the night of her unexpected election defeat. Her next-day concession speech, while saying the right things, was 12 hours too late to be considered classy. Crowley could be forgiven if, in private, he felt entitled to New York’s 14th District U.S. House seat. He was going for his 11-term as their congressman. But, given his concession speech, I suspect he knew well before election night that he was facing a candidate in Ocasio-Cortez with a message for which he didn’t have a winning reply. Ocasio-Cortez’ attack on the monied interests supporting Crowley resonated with voters. An anti-corporatist Democrat and an organizer for Bernie Sanders’ 2016 campaign, Ocasio-Cortez will likely win her general election contest and arrive in Washington, D.C. with an uncompromising agenda: Medicare for all, the abolition of US Immigration and Customs Enforcement and working to take corporate and wealthy-donor money out of U.S. politics. National Democrats aren’t used to this? New territory for Democrats? Wuh! Have we forgotten Vermont Senator Bernie Sanders’ near take-down of Hillary Clinton in 2016? Did that whole kerfuffle between Clinton, the corporate-funded establishment candidate, and that socialist ‘who wasn’t even a Democrat’ just slip by the national Democrats unnoticed? Democrats, it is OK to have a political memory that goes back before Donald Trump’s election. There is wisdom to be gleaned from understanding Sanders’ appeal to nearly half of all 2016 Democratic primary voters. Having that conversation now does not ensure the Republicans keep control of the House after the midterms or that Trump gets reelected in 2020. But that is what the entitled establishment-wing of the Democratic Party wants its voters to believe. Establishment Democrats must feel entitled to the general election support of Ocasio-Cortez’ 15,897 primary voters. They must believe the Democrats lose nothing by nominating corporate-cash stuffed candidates like Joe Crowley over young progressives like Ocasio-Cortez. They also believe those millions of Trump voters angry at the arrogance and duplicity of the political establishment (from both parties) will not be attracted to ‘socialists’ advocating a national health care system, the abolition of ICE, and the return of the our electoral system to the 99 percent. The Berniecrats are a authentic political force, even though they have yet to gain control of the Democratic Party itself. And may never. But with feeble DNC leaders like Tom Perez, the Berniecrats should feel confident right now. Even as he tries to co-opt the Berniecrats’ message, DNC chairman Tom Perez invariably sounds lame and insincere. When MSNBC’s Hallie Jackson asked Perez if the Ocasio-Cortez victory was an indication that its time for congressional Democrats to find new leaders, Perez didn’t flinch. “Time will tell,” he replied. The establishment Democrats are intellectually dead right now. They reflexively dismiss Medicare for all and a federal jobs guarantee as fiscally impossible — and they may be right — but by doing so they demonstrate their utter lack of understanding about how elections are fought and won in this country. Donald Trump is not the first presidential candidate to make promises he can’t keep (though he’s fulfilled more than most presidents). People respond to inspirational leadership and candidates like Ocasio-Cortez with big plans and even bigger ideas. Can this country finance Medicare for all? By Sanders’ own estimates, it would cost this country $1.4 trillion-a-year to implement such a health care system. With our current national budgetary priorities (and not even considering the future costs of climate change), where would the money come from to finance Medicare for all? Even if this country had decided not to spend $5.6 trillion on wars in the Middle East and Asia after 9/11, that still would have saved only $330 billion-a-year to put towards universal health care. It’s a tough budgetary problem and until this country starts winding down the multiple wars its has started or maintained under the George W. Bush and Barack Obama administrations, Medicare for all is a conversation for another day. We can’t threaten war with Iran, continue wars against Assad’s forces in Syria and the Taliban in Afghanistan, fight a proxy war with Iran against the Houthis in Yemen, and attempt to contain the growth of radicalized Islamists on the Africa and Asia continents, and still think we can fund anything close to universal health care. There is a reason the Republican-influenced Obamacare was such a lame attempt at universal health care coverage. The Democratic establishment knew they would have to give up too much up (e.g., regime change wars, the diversion of federal monies to Big Pharma, Wall Street and the never-to-be-ignored military-industrial complex) to do something serious about health care. Ocasio-Cortez is a direct product of the Democratic Party’s intellectual dishonesty with the American people over the past thirty years. Joe Crowley is one establishment Democrat that I believe is no longer in denial about how the Democratic Party fails the majority of Americans. He gets it because its reality slapped him in the face. And he stood up and took it with class. As to Ocasio-Cortez’ future in the Democratic Party, we will see how far intelligence, good-looks and charisma will can overcome the titanic forces in the party already arrayed against her. 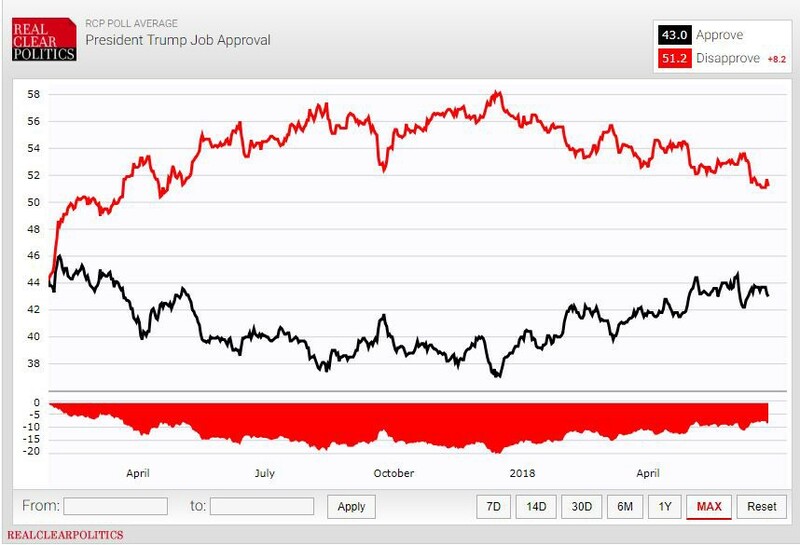 On June 11, 2018, President Donald Trump’s average job approval rating, according to RealClearPolitics.com, stood at 42.9 percent. On June 12, 2018, President Trump shook hands with North Korean dictator Kim Jong Un to start a negotiation process that could lead to the end of the Korean War and the de-nuclearization of the Korean peninsula. By June 16th, Trump’s average approval rating had risen to 43.8 percent — a mere 0.9 percentage point increase. Trump’s critics justifiably argued the Singapore Summit was inconsequential in that it produced nothing concrete other than an agreement to continue the negotiation process. Nonetheless, the images of the two leaders meeting were powerful and genuine optimism now exists about ending North Korea’s nuclear weapons program. Fine, so maybe the public isn’t easily manipulated by staged presidential media events anymore. Surely, the public can’t ignore the humanitarian travesty that was the Trump administration’s ‘zero tolerance’ immigration policy which included the premeditated separation of families upon their apprehension by U.S. border patrol agents. Can they? As the news about the family separations began to dominate the news cycle immediately after the Singapore Summit, Trump’s job approval ratings stood at 43.8 percent. After two weeks of intense and predominately negative news coverage regarding Trump’s family separations policy, his job average job approval rating is at 42.9 percent — a measly 0.9 percentage point drop. What does it take to move the needle on a president’s job approval numbers these days? In the age of hyperpartisanship, does the news matter anymore? Most people don’t experience a president’s job performance first-hand. While we do directly experience the state of the economy; and, if we are in the military or have family and friends serving, may have some direct experience with wartime. But, for the most part, what the average person knows about the president’s job performance comes to them, directly or indirectly, through a news media filter. Democratic theory posits that democracies are strengthened by an independent news media motivated to ensure greater transparency and accountability on the part of political leaders and institutions. And the empirical evidence as generally confirmed this relationship between public opinion and the news media. In their 1992 landmark study on what moves public opinion, Benjamin Page, Robert Y. Shapiro, and Glenn Dempsey found that “news variables alone account for nearly half the variance in opinion change” among American adults. But Page, Shapiro and Dempsey’s research occurred back when the news media was still viewed by the public as mostly non-partisan and objective. There was no Fox News Channel or MSNBC. Though, many conservatives even then decried the ‘liberal bias’ in the mainstream news media. Nonetheless, the prevailing professional ethic among journalists in the early 1990s was still to remain non-partisan and objective in their reporting. Yet, what happens if the news media, particularly those news outlets dominated by corporate interests (i.e., profit motive), adopt a partisan or biased perspective in the pursuit of readers and viewers? What if, in fact, the dominate news outlets are all either openly partisan or perceived by the public to be such? If most people were themselves non-partisan and objective, they might endeavor to get their news from a variety of sources in order to come to an enlightened opinion on the news and events of the day. Unfortunately, most Americans are not objective and, in fact, are becoming increasingly partisan. We are becoming so partisan that the term hyperpartisan is often used to describe Americans today. Through our living arrangements, workplaces, and online social groups, we are constructing walls around ourselves to keep out those with opinions divergent from our own. It is somewhat ironic that, at a time when many of us celebrate identity group diversity, we also consciously and proactively seek to reduce our exposure to opinion diversity. One possible consequence of this trend may be that, as individuals, we increasingly fail to educate ourselves with respect to the diversity of ideas and opinions existing outside our own personal realm. And we are enabled in keeping dissonant ideas and opinions out of our personal space through our news outlet preferences. If you believe the Fox News Channel’s viewers are dumb and racist hicks, why would you pollute your life with their preferred news source? You wouldn’t. And vice versa. If you believe MSNBC’s viewers are elitist snobs who prefer France over America, why would you watch Rachel Maddow or Chris Hayes? What could go wrong with this tacit arrangement? …I don’t know…perhaps the viability of our democracy? Perhaps our democracy’s ability to objectively incorporate new and pertinent information into the political realm, thereby making it difficult for our political institutions to make informed and rational decisions? How might this dysfunctional result of hyperpartisan become apparent? I believe an increasingly partisan public, in isolating their news sources to only those with similar partisan biases, makes it more difficult for new (unanticipated) facts and events to shape our political discourse in such a way to maximize the quality of policy decisions and outcomes. For example, if someone filtered their information about the Singapore Summit through ‘liberal’ news outlets (MSNBC, CNN, Washington Post, New York Times, NPR), they probably formed a negative opinion about its historical importance or likelihood of its achieving the de-nuclearization of North Korea. If their news source was the Fox News Channel, they most likely would have formed a positive opinion about the Summit. If you are not exposed to contradictory information about Donald Trump, why would you ever change your opinion about him? The result would be fairly stable presidential job approval numbers that may only change as slower-changing contextual factors change (e.g., the economy). There are two striking features with respect to presidential job approval over time. First, within every administration, job approval tends to decline consistently across a president’s term. That is why the first 100 days is so important in the policy-making process. The other striking feature is how the job approval numbers for the last two presidents (Obama and Trump) tend to operate within a relatively narrow range of values. With the exception of his first few weeks in office, Trump’s approval has varied between 37 and 43 percent approval. Likewise, Obama’s approval drifted mostly between 45 and 55 percent throughout his two terms. In contrast, Jimmy Carter’s job approval ranged between 30 and 70 percent, while Ronald Reagan’s ranged between 35 and 65 percent, primarily. 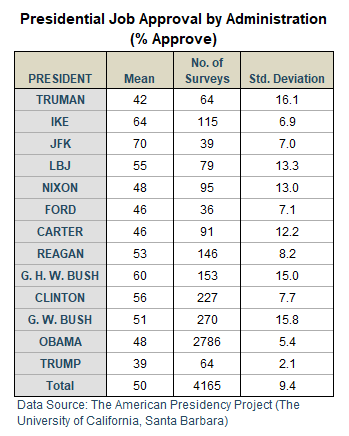 The table below summarizes the variance differences in job approval across presidential administrations. And why are we seeing less variation in job approval for our recent presidents? I contend that the number one suspect is the increased separation and isolation of American society by partisan lines. There are other possible explanations: (1) Today’s economy may be less prone to dramatic changes than in the past, (2) Presidents today may be better at minimizing dramatic declines in job approval (i.e., better at manipulating bad news), or (3) the meaning of presidential ‘job approval’ may have changed in Americans’ minds over time. And there are certainly other possible explanations. But the most likely cause, in my mind, is the possibility that the average American increasingly avoids exposure to dissonant information and opinions by only receiving their information from partisan news sources. If true, we should also expect to see more and more Americans lose their trust in the news media in general as they start perceiving ‘other’ news outlets as being partisan and biased. “Over the history of the entire trend, Americans’ trust and confidence hit its highest point in 1976, at 72 percent, in the wake of widely lauded examples of investigative journalism regarding Vietnam and the Watergate scandal,” notes Gallup Poll analyst Art Swift. 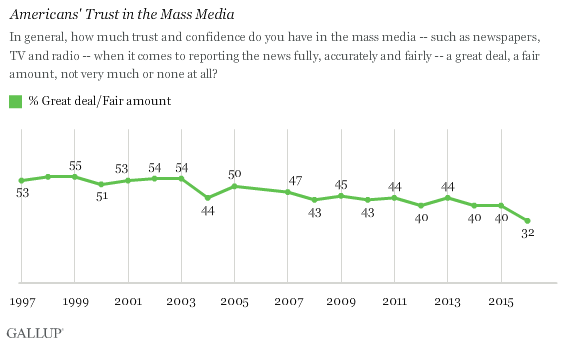 “After staying in the low to mid-50s through the late 1990s and into the early years of the new century, Americans’ trust in the media has fallen slowly and steadily. It has consistently been below a majority level since 2007.” Not coincidentally, the two presidents since 2007, Obama and Trump, have experienced the lowest levels of variance in their job approval ratings. 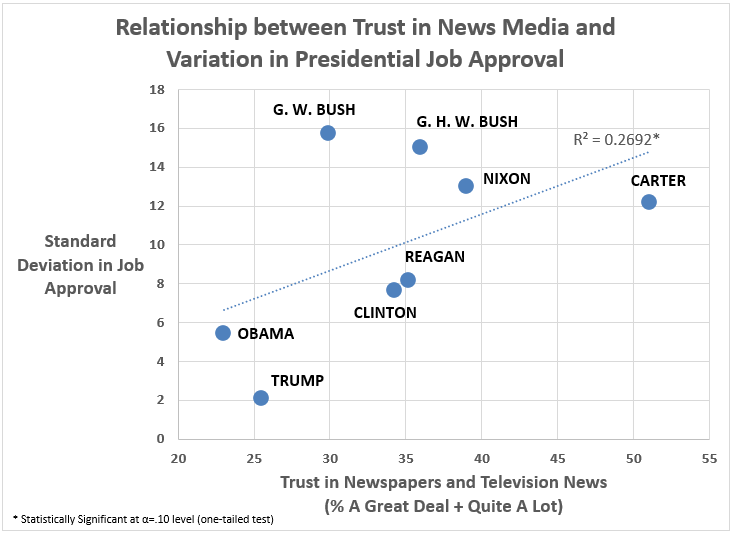 Our final graph (below) shows the relationship between the variance in a president’s job approval ratings and the trust in the media held by the American public during each president’s tenure. The relationship is statistically significant. When Americans distrust the news media, in general, their opinions regarding the job performance of the president tend to become more stable. As it is less likely they are exposed to information contradicting their own partisan bias, they are also less likely to change their opinions regarding political matters such as the president’s job performance. If true, that is a real problem for our democracy. If all people hear is information confirming what they already believe, how can they properly react to objective and important changes in the information ecosystem? The above graph is not conclusive evidence but is suggestive of a serious dysfunction without our democracy. A malady that, if left uncorrected, may make it increasingly difficult for our elected leaders to implement timely and constructive decisions when addressing serious social problems.